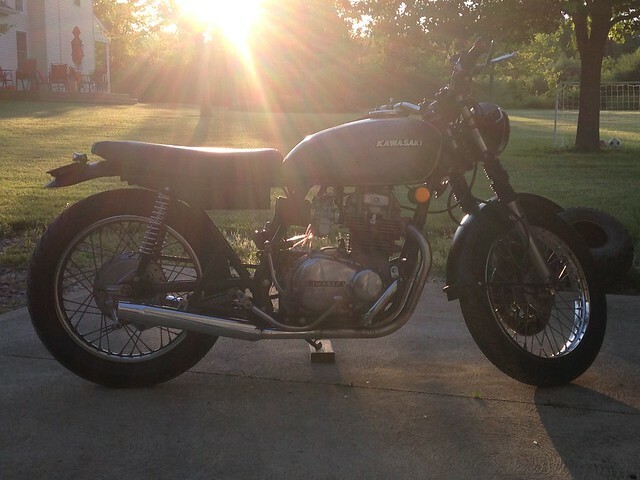 Took a few glamour as the sun was getting low in the sky after a short ride last night for some carb tuning. This is what I started with about 4 years ago. Nice looking bike. Is that a naked steel tank or is it painted? Thanks davido. 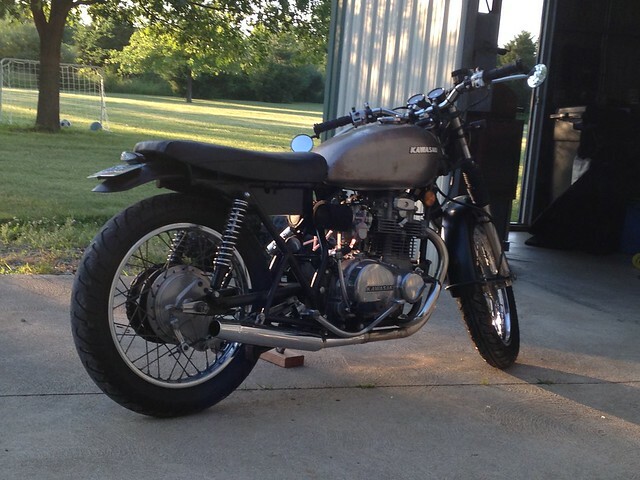 It's been a fun project and I've learned a lot (was my first bike) and have since added another KZ400 (1978 B1) to my collection and I'm always looking for more Kawasakis. 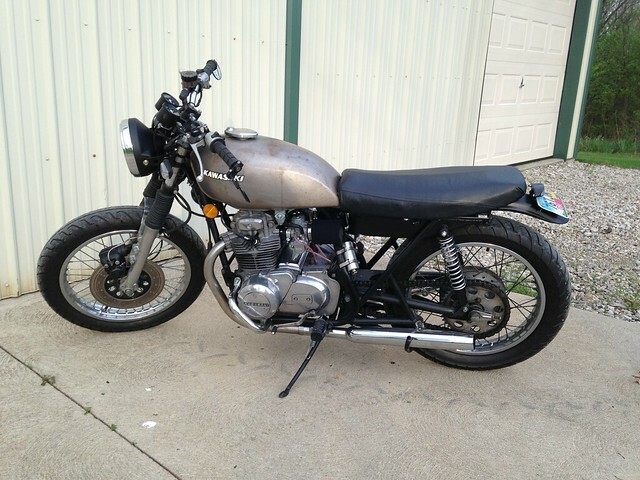 KZ900s and 1000s are too far above my price point right now but the next two I'm pining for are a KZ750 twin and a GPz 750. But I must have let some moisture get in before the clear or I just didn't do a very good job covering it, which is more likely, so a little surface rust has showed up in a few spots underneath the clear coat. I don't mind the vintage patina look for now but I may paint it eventually. I just haven't figured out a color or style that I want to commit to yet. Seems like I have a fear of commitment as this thing gets closer to done. I didn't mind cutting off tabs for airbox and other irreversible changes early on but now it's tougher. For instance I recently put the stock fender back on - I wanted to cut it down some but I couldn't decide exactly how much I wanted to cut off so I just put it back on whole. I recently swapped tanks to a new (to me) 1975 tank with a new repro gas cap. I liked the naked steel look but this just looks right. 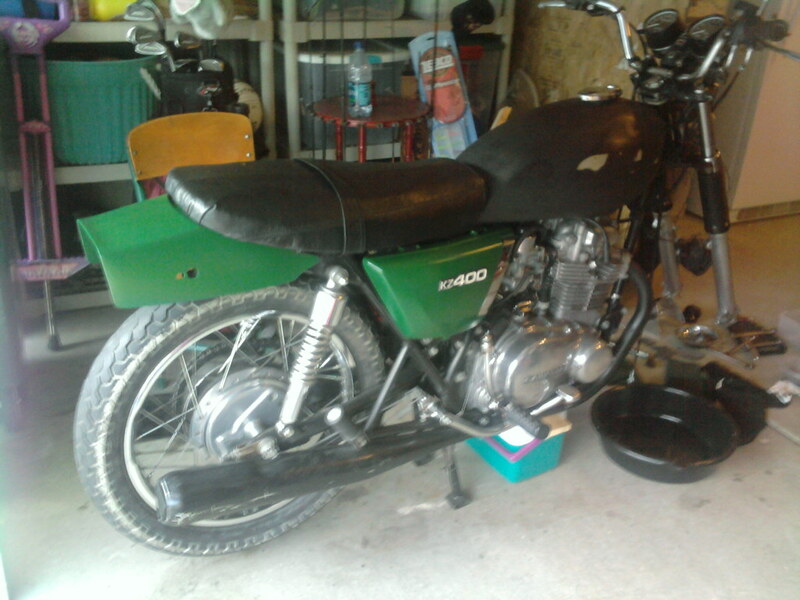 It now looks like a proper mid-70s Kawasaki. I practically stole the tank on Ebay - sorry and thanks if it was any of you all. The tank looks great in the pic but it has a few small scratches here and there, just minor stuff. 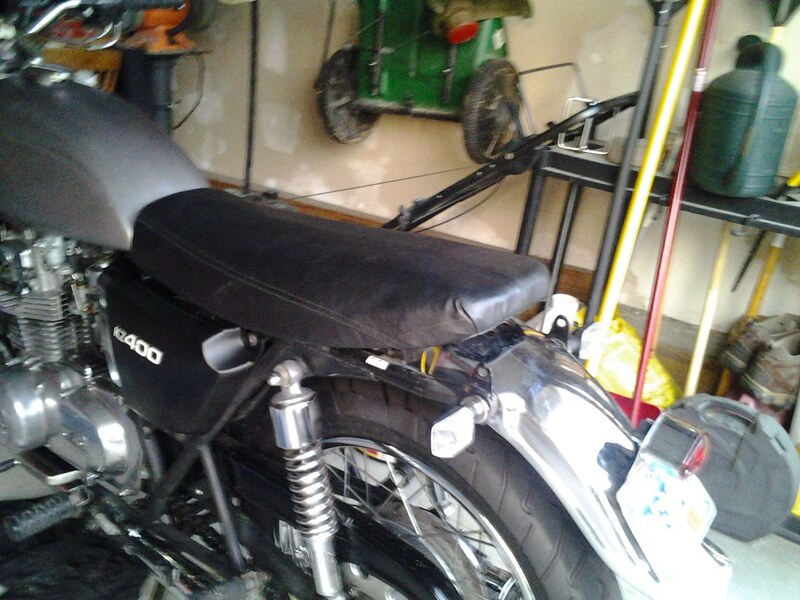 But I think it's perfect for a nearly 40 year old motorcycle. It looks like someone recently re-cleared it - it has a lot of shine. Other than a few odds and ends and regular maintenance I think I'm about done "building" (restoring/restomodding?) this bike after 4 years and way too much money. It's my first, I love it and I think I'll keep it forever - despite the lies I've told my wife about selling both bikes to fund the next one after I'm done with the scrambler. I'm sure the next one will be happy to join the herd. Looks great Grimey. 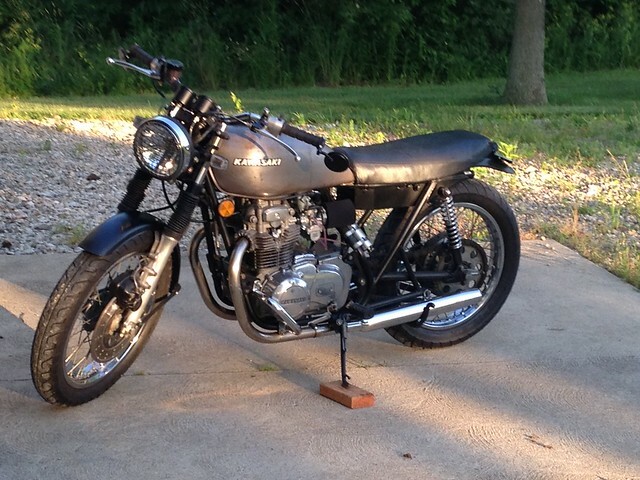 The KZ400 is underappreciated but a really fun bike and IMHO one of the better looking ones. "If you didn't build it, it's not really yours"
HA, a see through bike. Just joking. Reminds me of my 73 350 Honda. Me and that bike went everywhere. Went from it to the Z1. I kept it for a while, hated to sell an old friend. It didn't have a counter balancer and I've wondered if that made a difference or what? 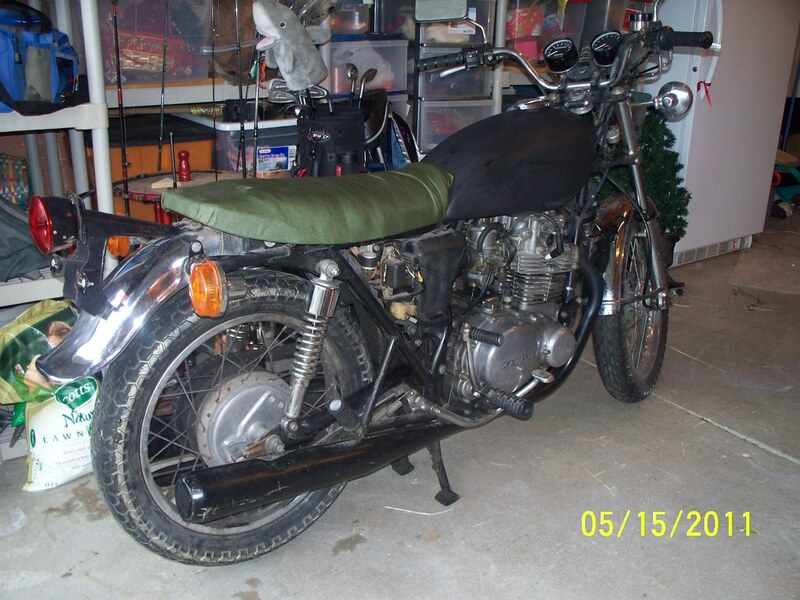 I was looking at bigger Hondas, the 500, then the 550 and 750 but my friends all had Z1's so I had to get one. Never looked back. Thanks, Steve. I'm sure I'll move on and up eventually. 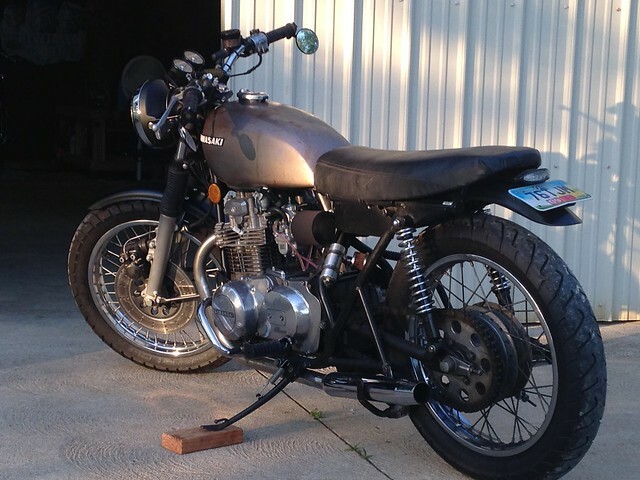 The next two I'm keeping an eye out for are a KZ 750 twin (easy step up from the KZ400 - share a lot in design and even some parts) and a GPz 750. And of course I'd love to eventually get a 900/1000. I'm definitely a Kawasaki guy through and through (like my Dad used to be) but I wouldn't turn my nose up at a CB750 either - though I don't know if I could get used to the Green wire being ground! 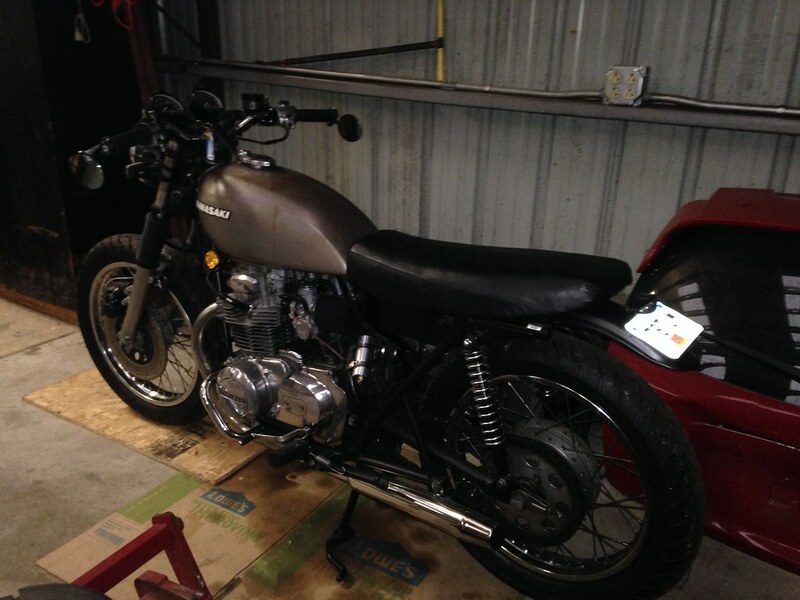 Currently I'm having fun getting riding experience and pushing that light little KZ400 through the country twisties. 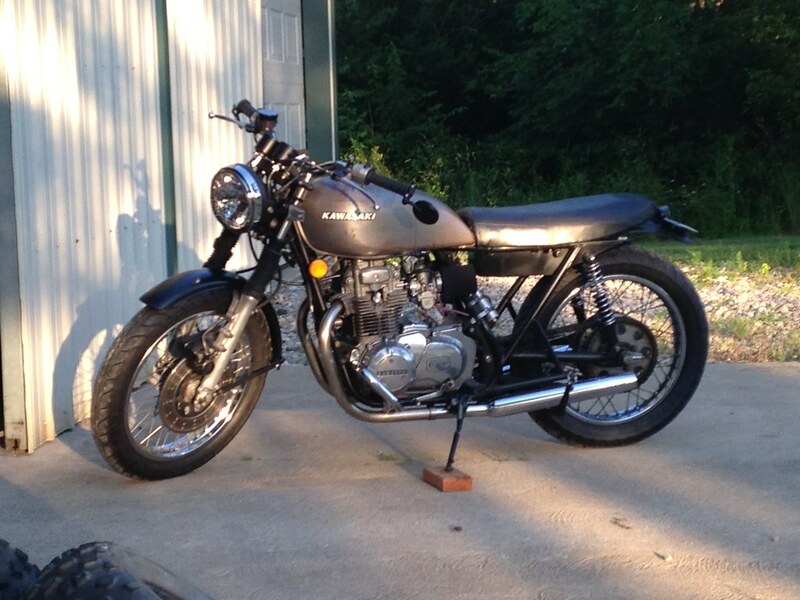 I know a bunch of guys who have and love their CB 350s. That was also one of my Dad's first bikes - he was telling stories about it while restoring a '72 Triumph Bonneville in my shop over the winter. Yes, it is a see-through bike but it's not just for looks (okay to be truthful it mostly is ). I shaved a lot of weight going to a small lithium-ion battery, relocating everything that needed to be kept and removing a bunch of brackets. 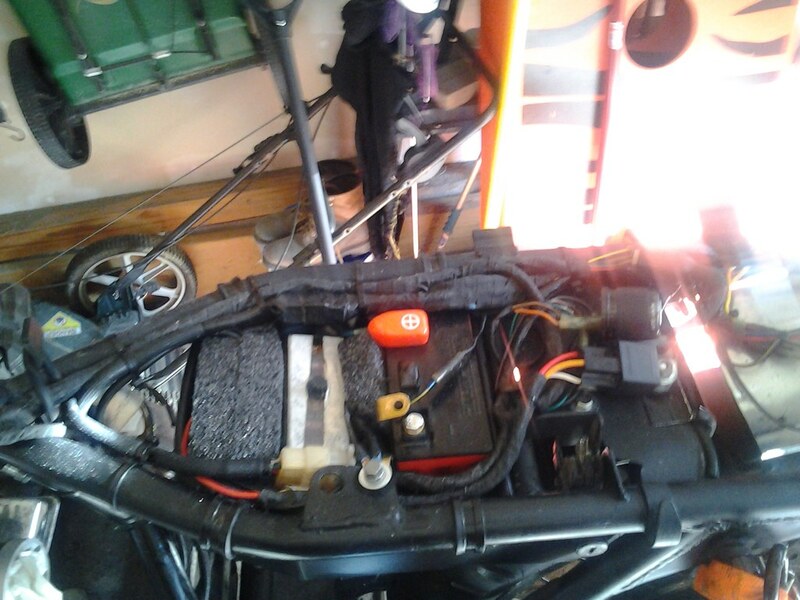 And in the process there were a lot of upgrades too like a modern reg/rect combo, switching to a modern fuse block, swapped over the the ignition for the later KZ440 electronic ignition bits, etc (that's not everything I've done - just the stuff relating to the open triangle area). I've replaced every seal and bearing in this bike - the only thing I have not done yet is open up the engine but I'll probably have too sooner or later to fix the slight oil seepage around the heads. The leaks seem to be getting a little bit better though. When I first got it there would be a couple drips underneath it but lately it seems to just be confined to the front of the block being "wet". Maybe putting some miles on the old dog has helped some of those old gaskets out. 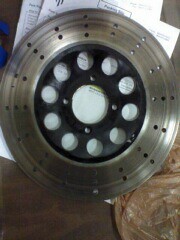 And speaking of weight savings I really want to weigh the thing now to see how much I have shaved. Hopefully I'll get a chance this weekend. 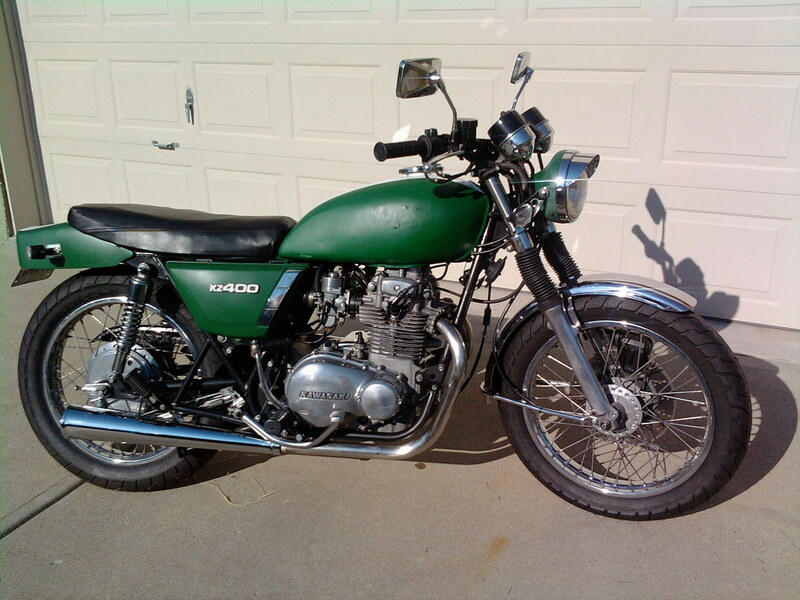 A few more pics of the bike on the day I picked it up much to the chagrin of my dear wife. I thought it was beautiful (being my very first motorcycle) and something I could work with. She said it was a piece of junk - she was right. 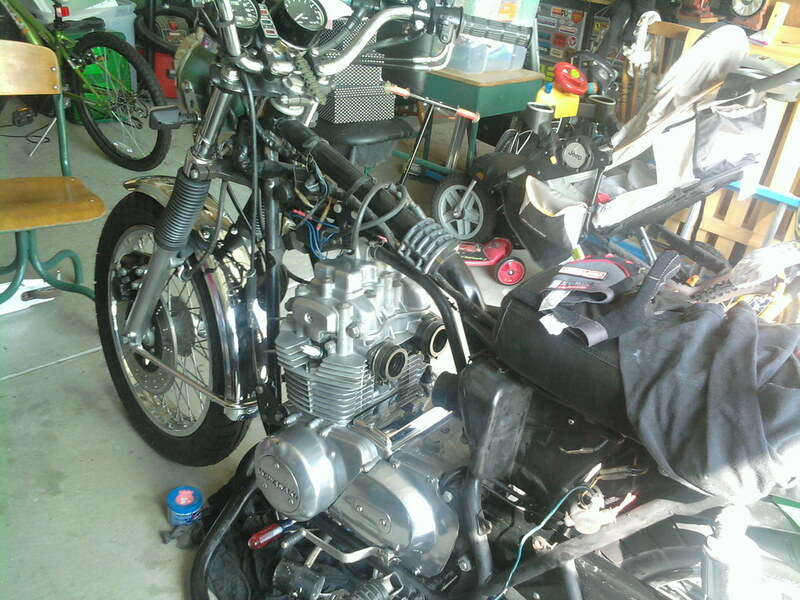 But not only was I looking for a bike to ride, something I could learn on, I was also looking for a project, a hobby. 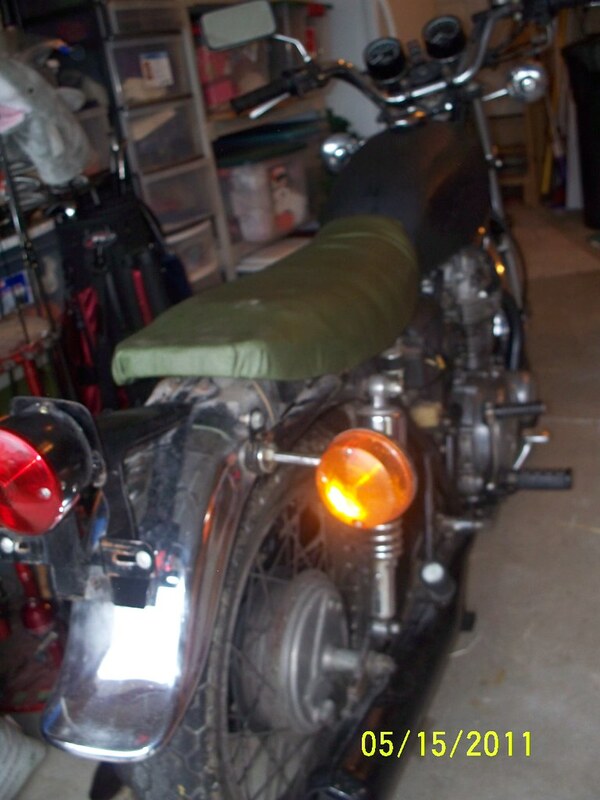 It was cosmetically challenged, missing seat cover, a side cover and lots of other stuff but It ran... mostly. It was in much need of cleaning, which is why it earned its name Grimey. I think I spent two days cleaning build up oil and grease from everything. And I would soon learn that it needed a lot of maintenance stuff done too. 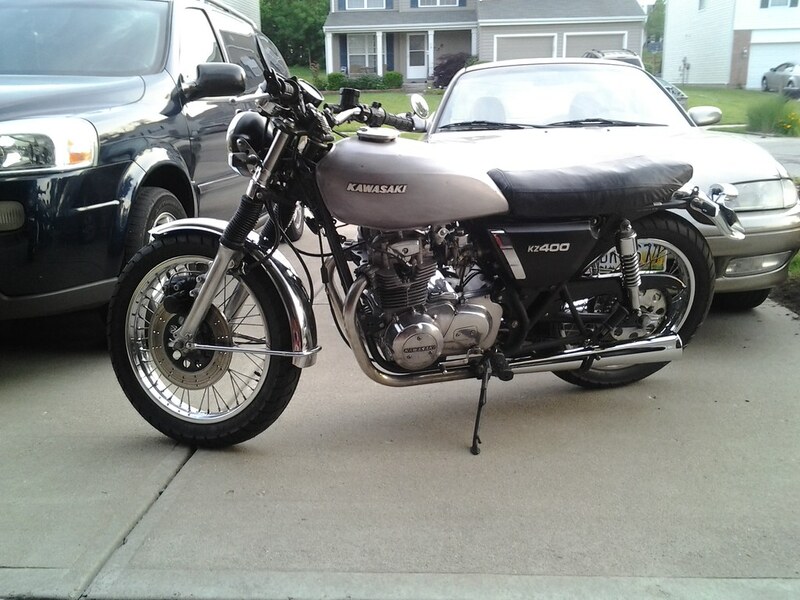 Tires were old, carbs needed a lot of work, front brakes were sticking, threads on front axle were stripped (nut was just hanging on), most of the cables needed replaced, both clutch and brake levers needed replaced, coil was iffy, fuses looked like the originals that came with the bike. The only wear items that were in good shape and that I still haven't touched were the chain and sprockets. After cleaning it up one of the first things I did was cover the seat. I found a long girl's black leather jacket, made of some nice thick leather with a lot of character, at the local Goodwill. I used that to cover the seat. I found that someone had already tried trimming down the stock foam a bit but did a poor job, it was pretty lumpy in places. 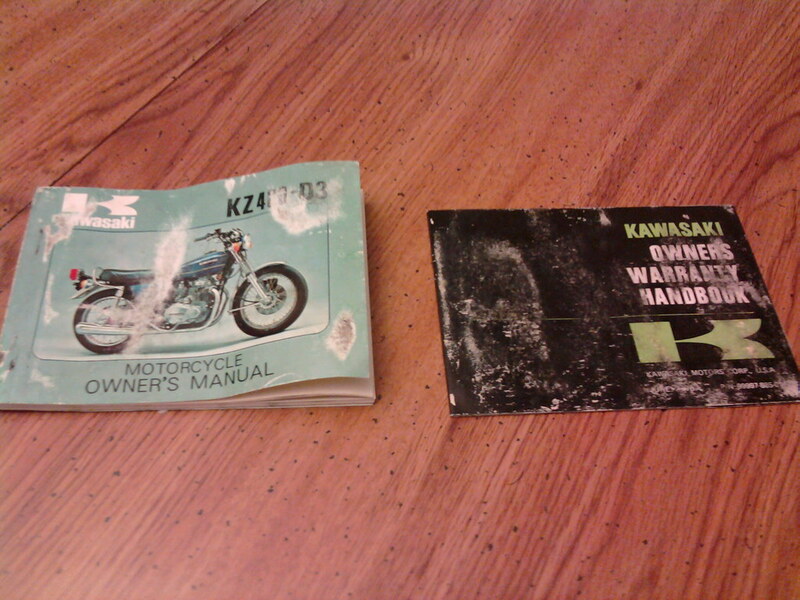 I also discovered the original owner's manual and warranty book in the comparment under the seat. Bonus! 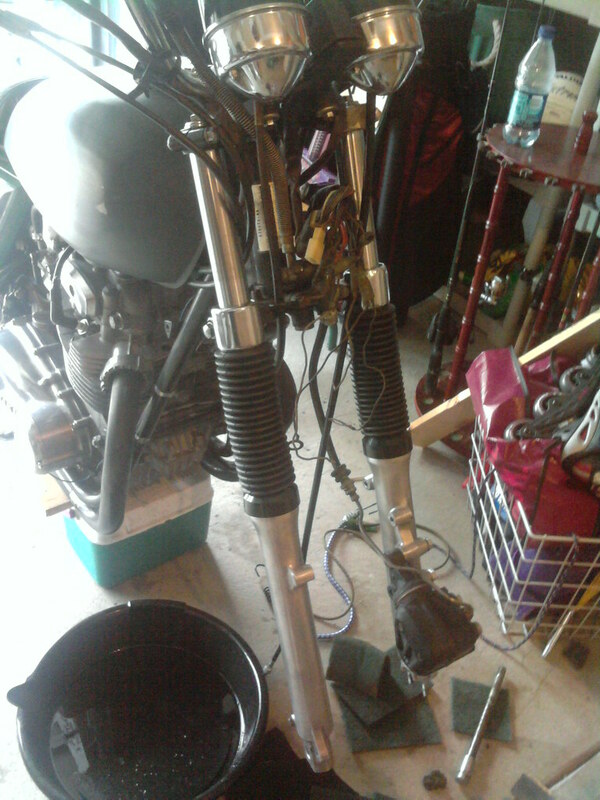 Next step was some maintenance on the front forks. I drained the oil - it was the most horribly smelling thing I have ever experienced. It might have been the original that came with the bike. I replaced the seals and sliders and added a pair of gaiters. Luckily the forks were in good shape, just some slight pitting up around the headlight brackets but nothing anywhere that mattered. Hmm... turned out more John Deere green than British Racing Green. 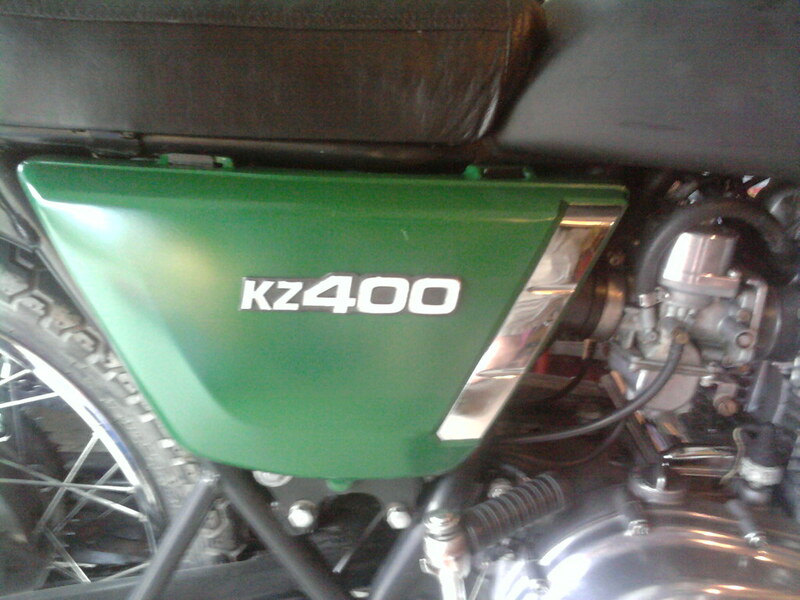 I added the tail section of a later KZ400 because I thought it looked cool... at the time. 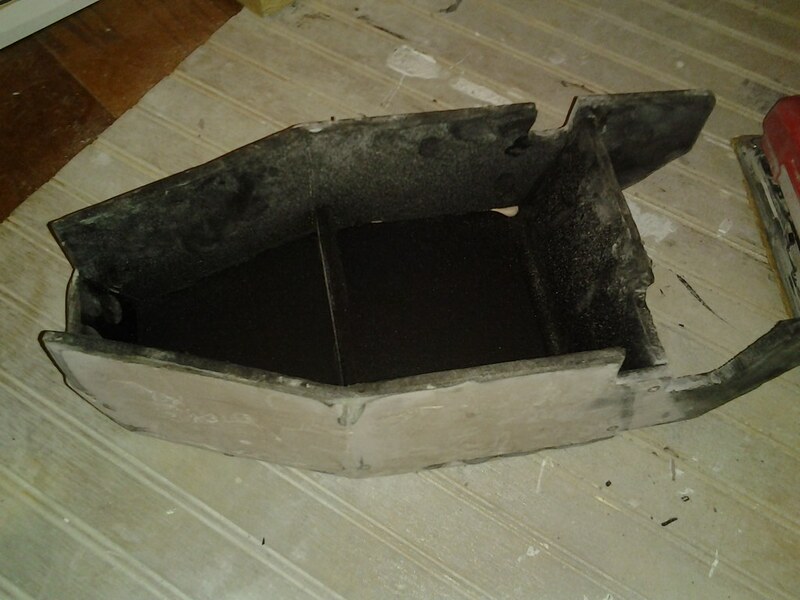 I also sanded down the tank and found a huge dent in the right side filled with a lot of bondo. But it seemed okay for now. 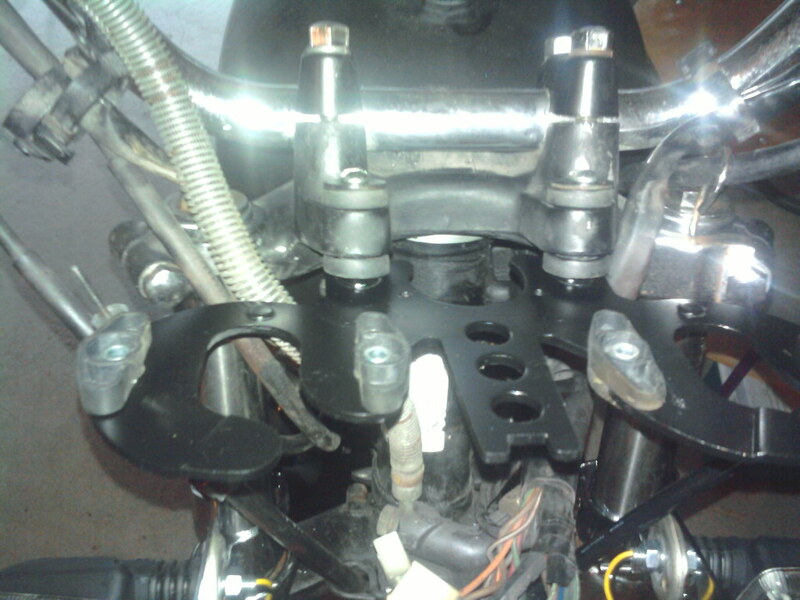 I swapped over to an aftermarket headlight bracket and lowered the headlight and gauges. PS - I have more pics of how the lower the gauges if anyone is interested, I've had a few people ask. 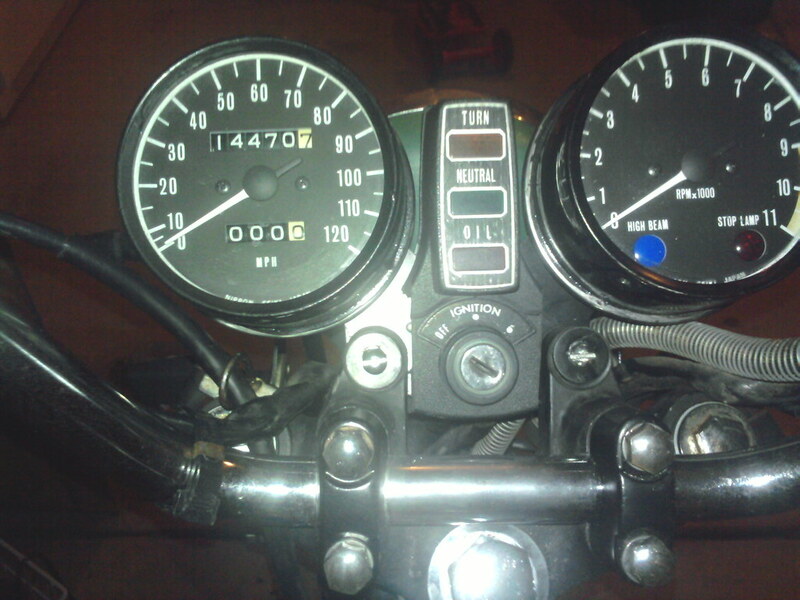 Gauges lowered a bit and bike has less than 15K miles on it. It looks bad but I'm finding that major parts are in pretty good shape. 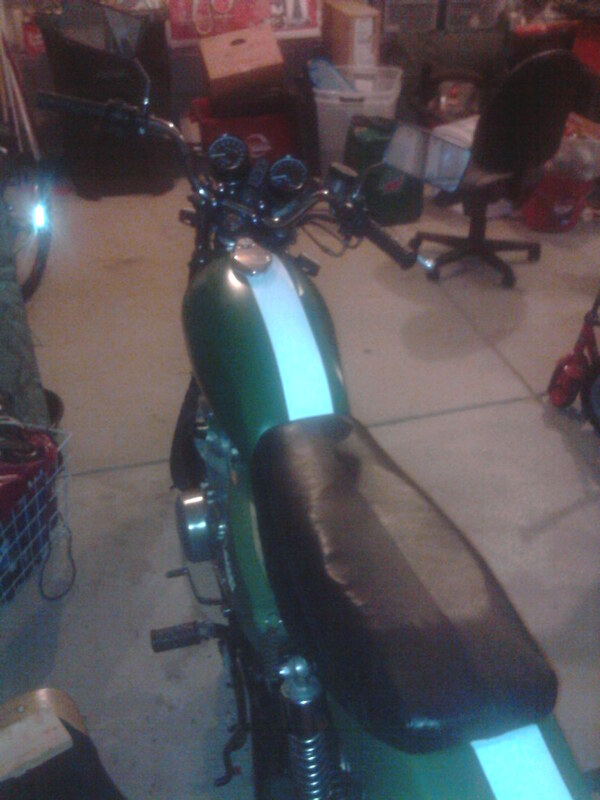 Painted the tank green and added a white racing stripe. You can see the lumpy seat that I mentioned before in this pic. It's alive! Well, almost. But it did get new tires, Shinko 712s and I painted the left and right hand controls. The rims cleaned up nicely and turned out to be in much better shape than I even hoped. Front fender and shocks cleaned up great too. It was starting to look like a real motorcycle. I could now ride it up and down my driveway and wait for the day when I took my MSFT course. K&N filter and after running into my first electrical troubles (just a blown fuse) I replaced the stock fuse block with something more modern. Added some farkle I removed not too long after. Couple steps back to move forward. Carbs off to be cleaned again and pipes off to cut the stock mufflers off for replacements. 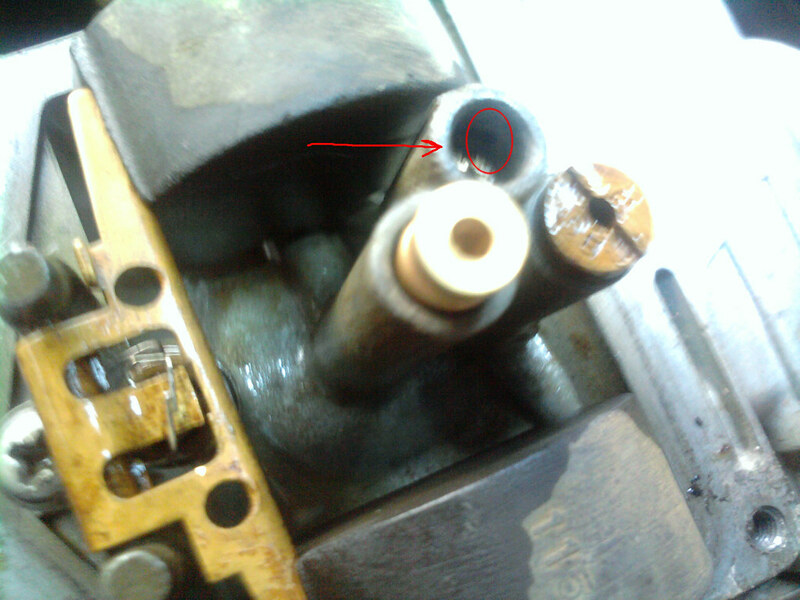 A PO had drilled out the stock mufflers and sprayed everything flat black to cover years of wear. They were way too loud and looked bad. After swapping out coil, lubing up advancer, cleaning the carbs multiple times I finally figured out why the bike had a hard time starting, wouldn't rev past 4K and smelled like it was running really, really rich. The rubber plugs to cover the pilot jets were missing. I could not find stock replacements but the rubber pilot hole plugs for a GS1000/1100 work well enough though they do need trimmed down a little to fit. I can go find the part number if anyone needs it - I still have a couple in my parts bin. 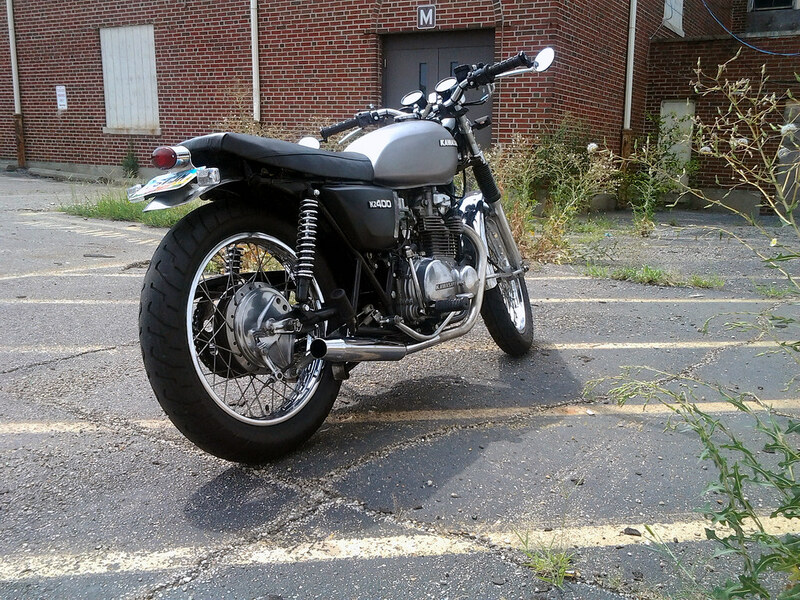 Swapped over to a set of superbike bars, added some Oury grips, and put on a pair of Emgo megaphone mufflers. I also discovered that even though the headers had been painted flat black they were not too bad underneath the paint. There were a few little spots of rust but they cleaned up well enough and after the scuffing to remove the paint look more like brushed stainless than chrome. But there's an issue that's about to change things up. See the right side of the gas tank where it looks like the paint is bubbling? Remember the big dent that I mentioned in the tank with all the bondo? Yeah, not only was there a dent but a couple pinholes or two that is causing the bondo to come apart. 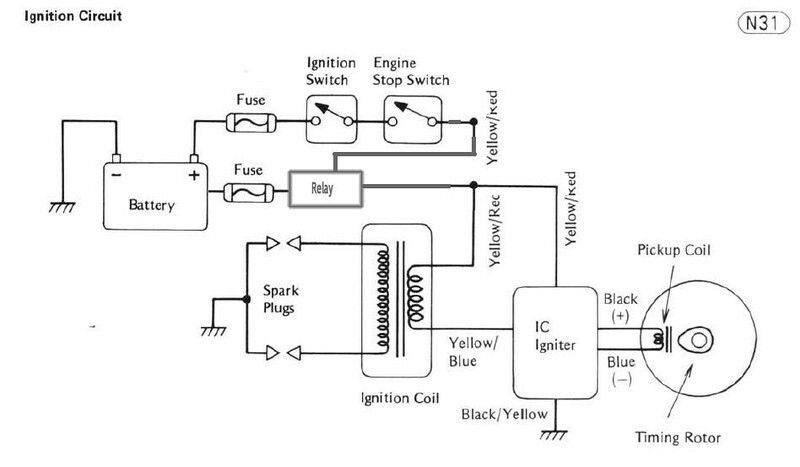 But first let's swap out the points for the electronic ignition from the later (81+) 440s. I'm sure points are great, lots of guys say they are but by the time I started working on cars (mid 80s) points were replaced by HEI and to me they seemed like magic. Doing the swap is really as simple as bolting on the parts and knowing where to splice in the wires once you understand the system. I scored a really nice thank that was clean inside and out on Craigslist. The paint on it was really rough and I had to strip it though. 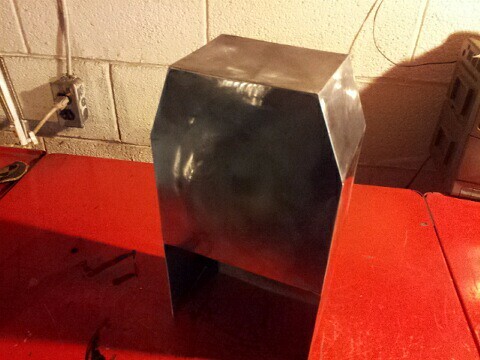 I liked the raw steel look and just covered it with a couple layers of clear to keep away the rust. Now the green accessories didn't look very good so I painted the headlight bucket and the side covers satin black. And I realized the error in my ways with the tail piece. 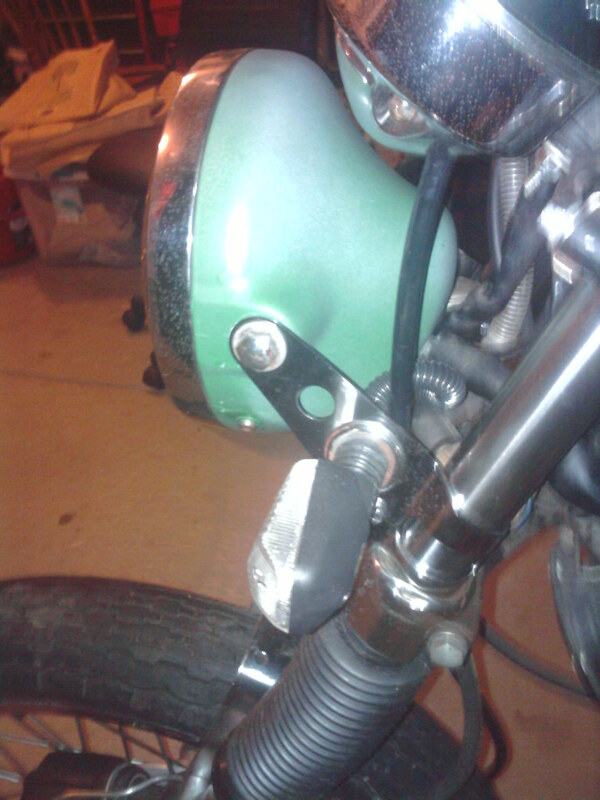 I removed it and put the old duck-billed fender back on. Ugh, that lumpy seat though. I had to fix it. 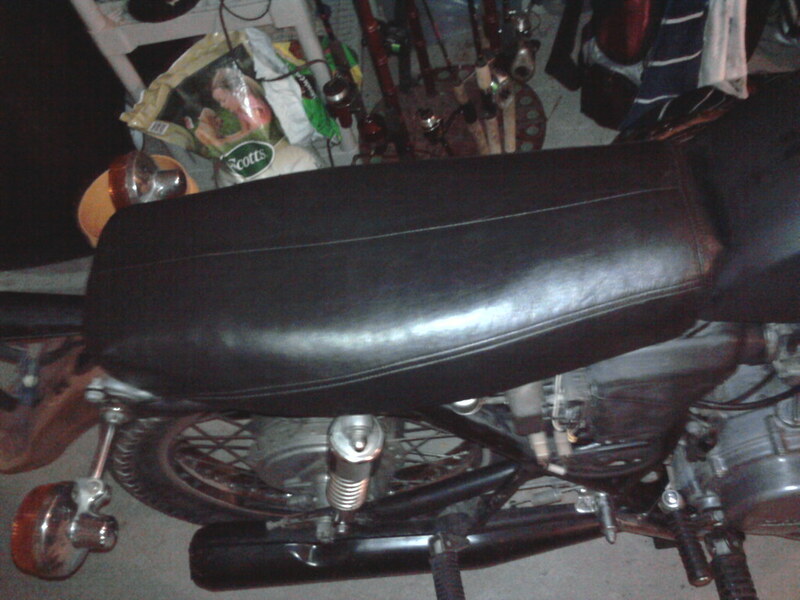 I took the seat cover back off and did some sanding and shaping. Much better. Not professional but much better. I went through several iterations of rear turn signals and tail lights. 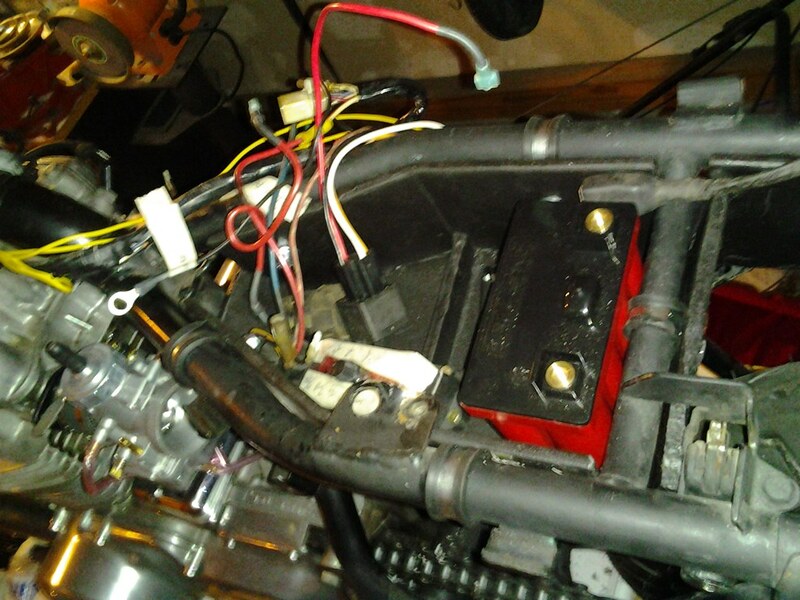 I learned about these Chinese rectifiers from Captain Awesome, I believe, over on the KZ400 forum (Kawasaki Twins Owners Forum). I didn't need to replace mine but I thought it would be nice to have a spare. I didn't like the big bulky old fender since this bike was starting to look light and sleek. I found an old '76 Honda front fender that had a little bit of damage to a part that I wouldn't need, cut it in half and replaced my rear fender with it. Much nicer. 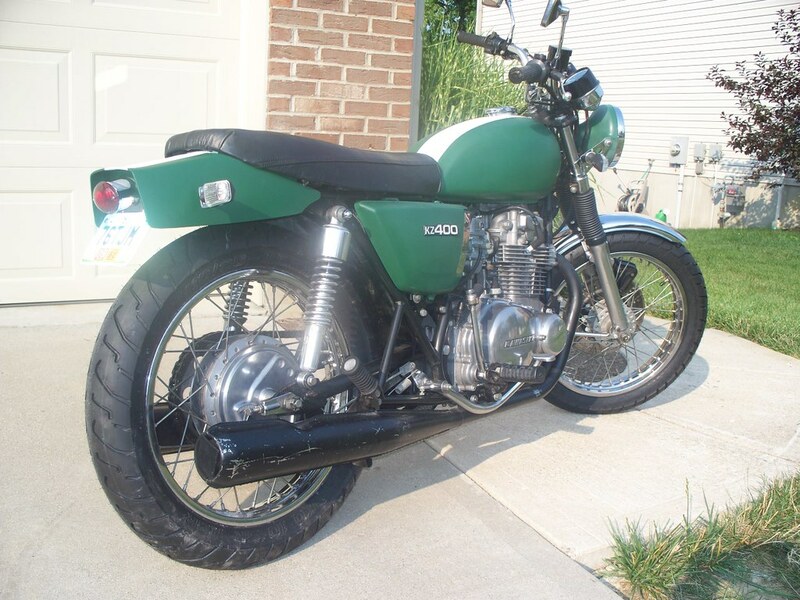 I also found a pair of MAC slipon mufflers for the KZ440 at a clearance price that I couldn't resist. 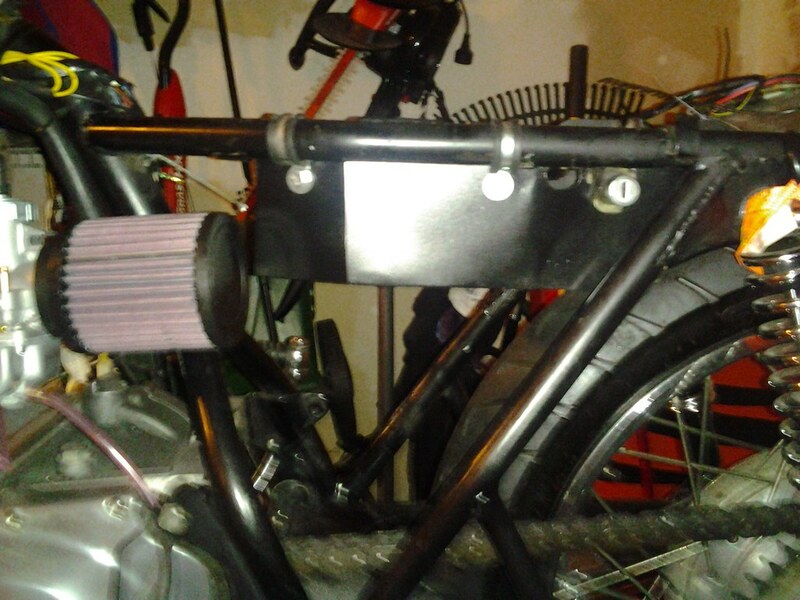 The new mufflers mounted up great and sounded great compared to the Emgo megaphones. The first cut hurts the most. 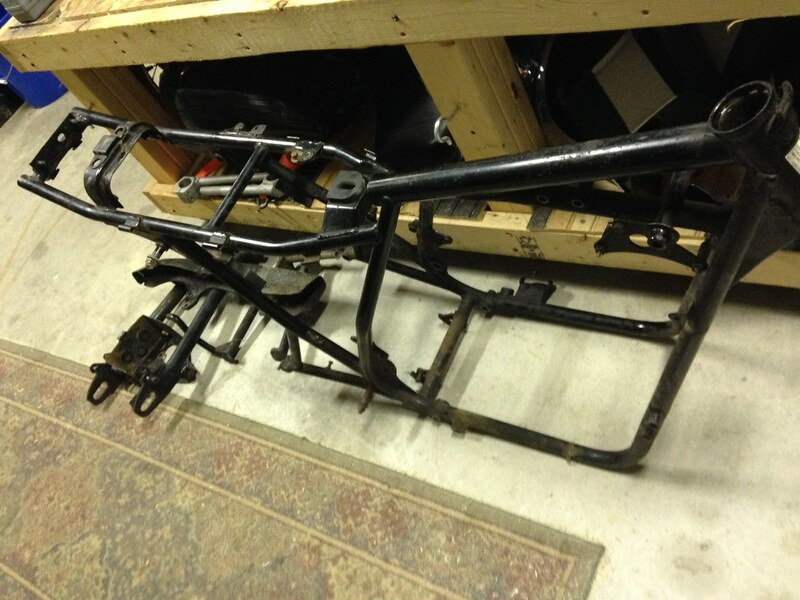 The rear of the frame with the fender supports is ugly, It had to go. This was the first time I permanently removed anything. It looks much cleaner now. I found a new pair of shocks to replace the 35-year-old stock ones. They looked perfect too. They are a pair of 11.9", if I remember correctly, Emgo shocks that are a Girling reproduction. I have not seen them around since I bought that pair - who knows, they may have been the last pair on earth for all I know. 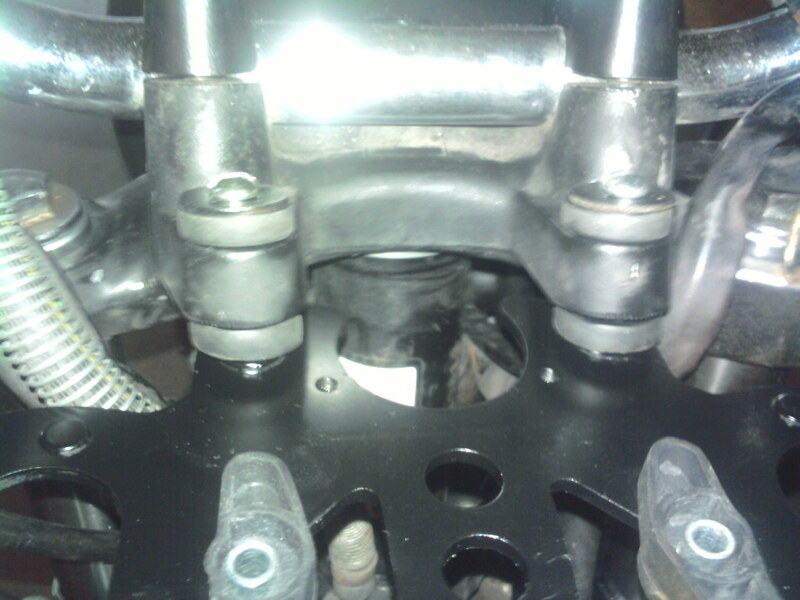 With the rear lowered about 1/2 to 1 inch I pulled the forks up through the top triple about the same amount. The bike is not slammed but it is visually considerably lower. Not sure when but at some point I changed from the stock mirrors to bar end mirrors too. And I lowered the gauges more. I like the flatter look the front of the bike has now. By this time, about a year after I bought it, the bike was looking fantastic and running really well. I was starting to trust it more and taking it on short trips through town and on longer rides on our back country roads. That would change soon though. I probably should have stopped here and been happy. Many times I wish I would have. Not saying that I'm not happy now, I'm ecstatic, I love my bike. And if I had stopped then I wouldn't have experienced and learned the things that were to come. But that was a really good looking bike with the bare steel tank and the black side covers giving the bike a little bulkiness that just looks good. Too bad it's not around any more. Wow, I was amazed to read at the end the bike went through all those changes in a year. Looks awesome! Dan, this thread is reading like a novel! I'm suspecting tragedy however so do you mind finishing the tale for my hearts' sake? On another note, I get what you mean about the rear end. Personally, your English green with the duck bill version looks tight!! That said though, the cleared tank and satin black streamlined version is a thing of beauty. At the end of the day, I find myself drooling over the same bike twice lol. I hope your riding exam went well and you are enjoying the road! You've done some fantastic work on your 400. As long as I get to learn something, I'm happy! 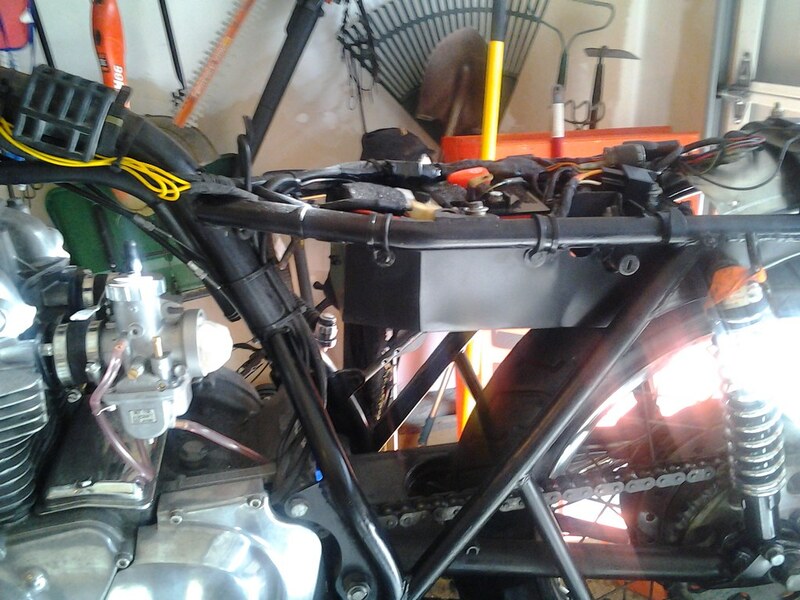 By late fall of 2012 I decided that now that I had the bike running well and in tip-top shape and I had learned a lot about working on bikes that I wanted to take the next step and do some relatively major work on the bike. I wanted to clear the triangle, that's what all the bikes on Bike Exif had right? To do so I would need to switch to pod filters, use a smaller battery and relocate the electronics somewhere else. 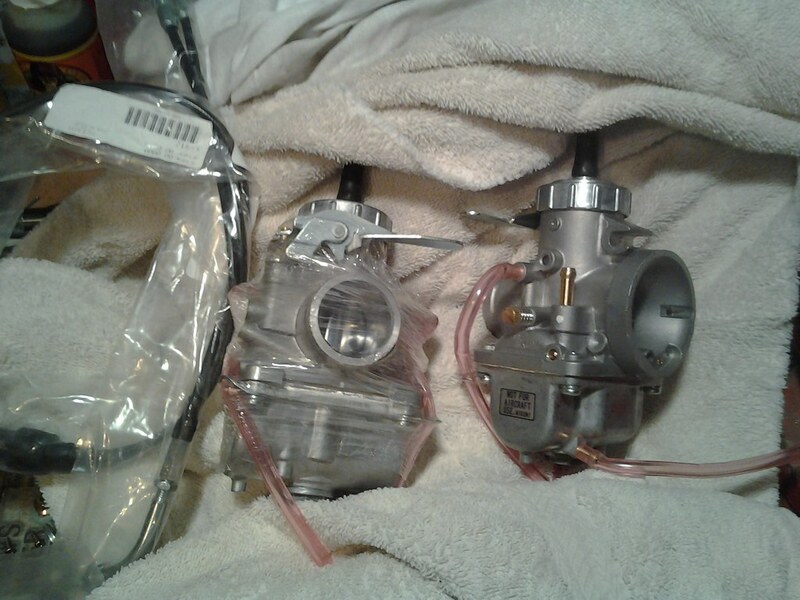 I knew that I didn't want to try pods with the stock carbs so that meant a switch to some type of mechanical carbs like Amals or Mikuni VMs. The lithium ion batteries, like Ballistic, had been around awhile and people were having pretty good success with them. But they don't like overcharging and the nearly 40-year old charging system on the older bikes are known to overcharge. 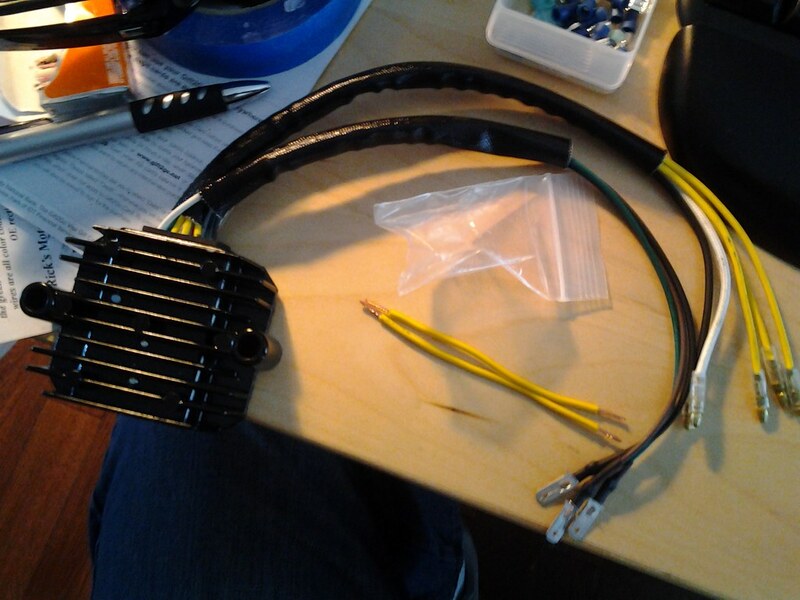 So the swap would also involve updating the regulator and rectifier to something more modern. There were 2 or 3 guys on the Kawasaki Twins forum going through the same type of swap at the same time I was talking about it. One was using 30mm Amals (IIRC) and one using VM32 on his 440. I knew that I'd be able to get in the right ballpark as far as jetting. 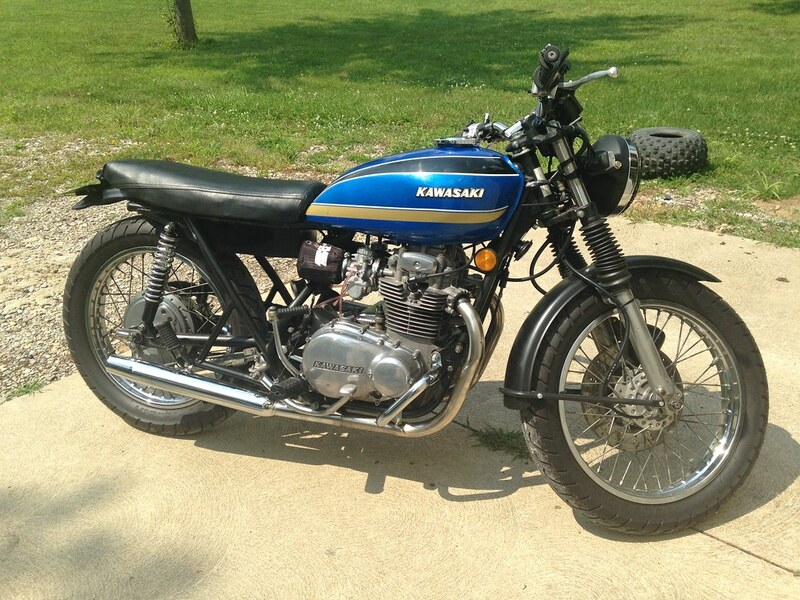 My mind was almost completely made up and then I found a pair of Mikuni VM30s on Ebay that were still in the plastic (guy bought them for a CB350 or 450 project but didn't use them) for $100. 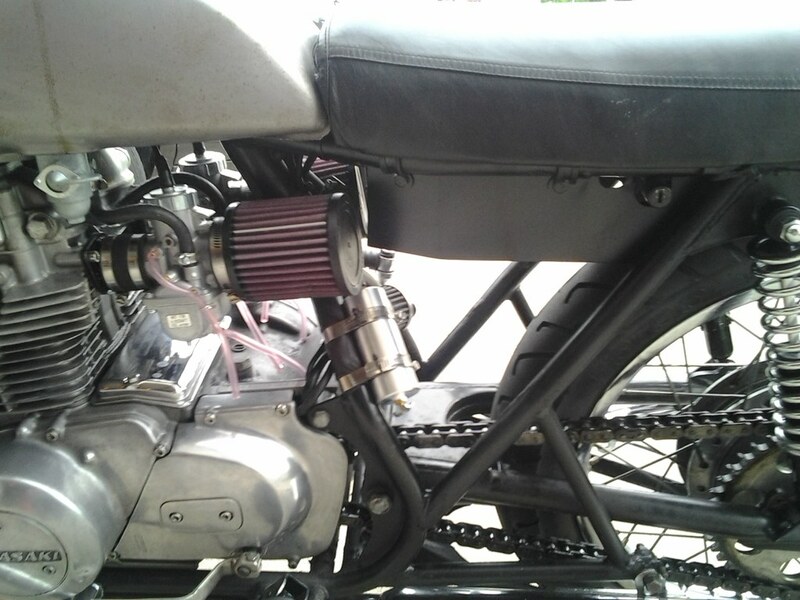 Another member of the forum, Jerry, began making custom intake boots as a replacement for the unobtainable stock boots for the early KZ400s. 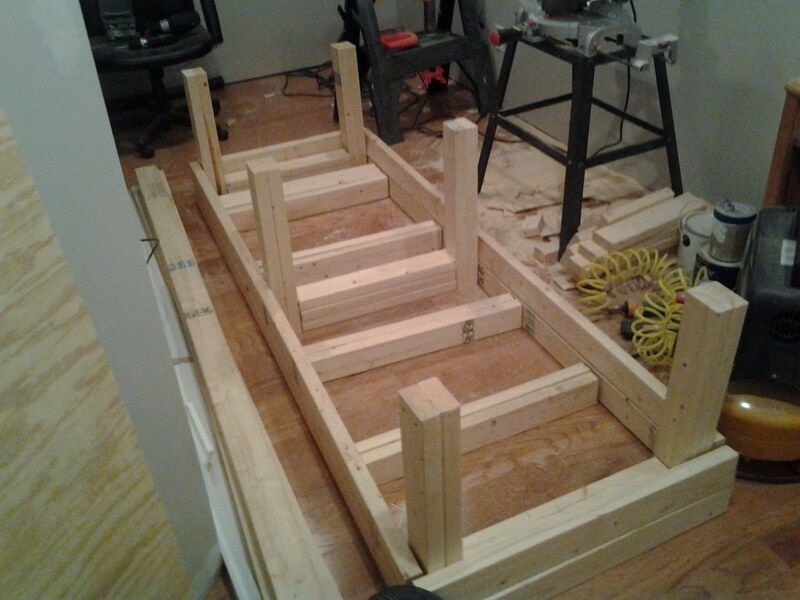 I started building a heavy duty bike bench from leftover materials from our basement remodel. 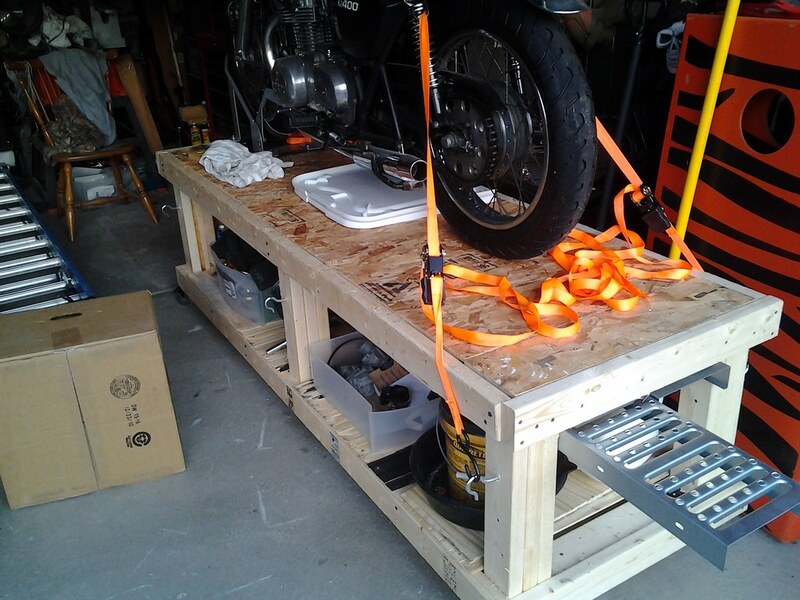 It had eye-bolts for tie-downs, storage underneath and a shelf for storing ramps. It had locking rubber wheel casters too but they later disintegrated and were replaced with something a little heavier duty. 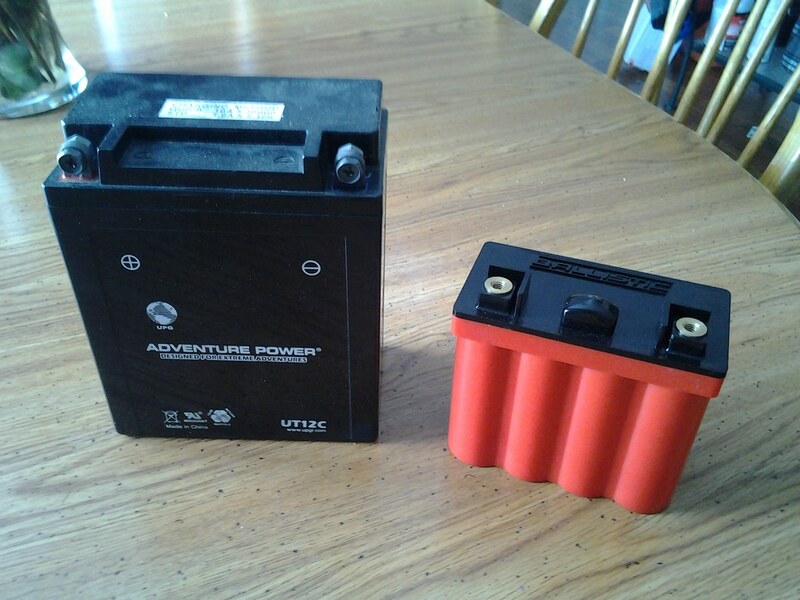 I bought a Ballistic 8-cell battery. It was almost 1/3 the size of the AGM it was to replace. And a new Rick's Electronics Regulator/Rectifier combo. 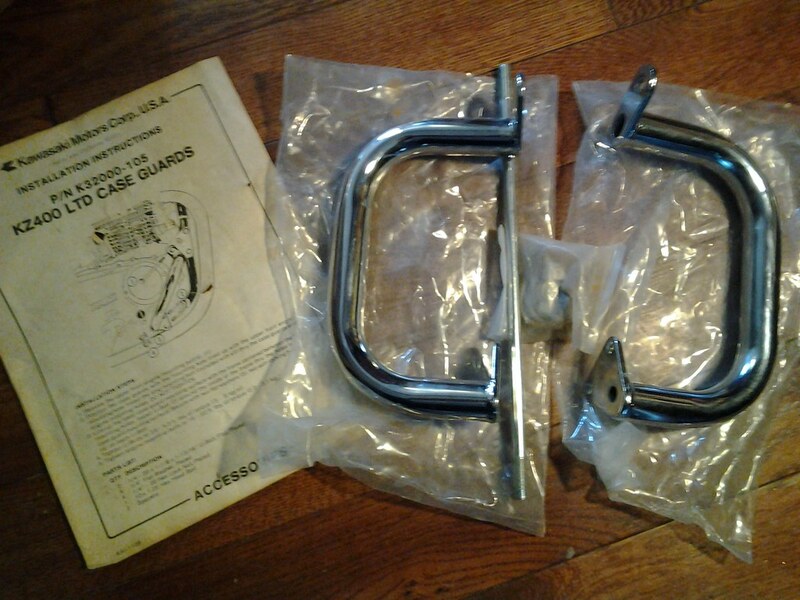 Another Ebay steal was these Kawasaki NOS case guards for around $35. 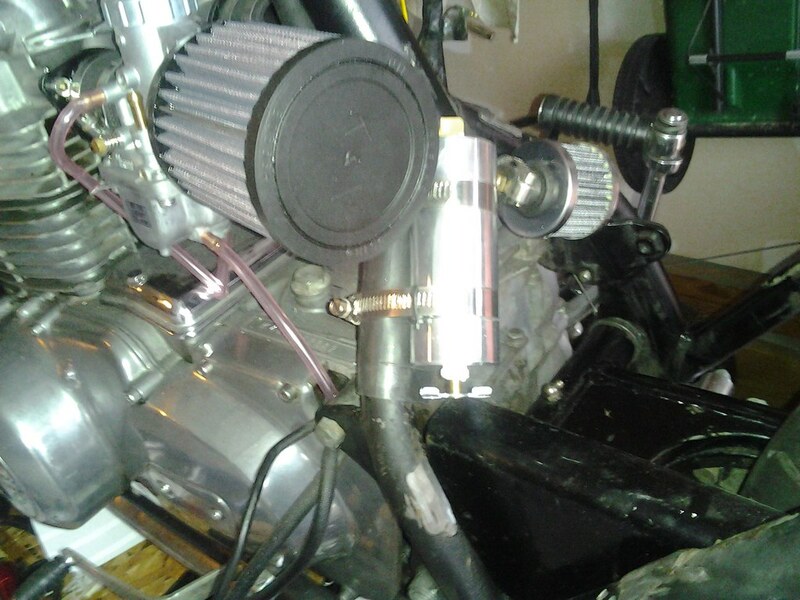 One of the final pieces of the puzzle was what to do with the crankcase vent. I bought this sweet little stainless catch can from Pegasus Automotive for around $25(?). 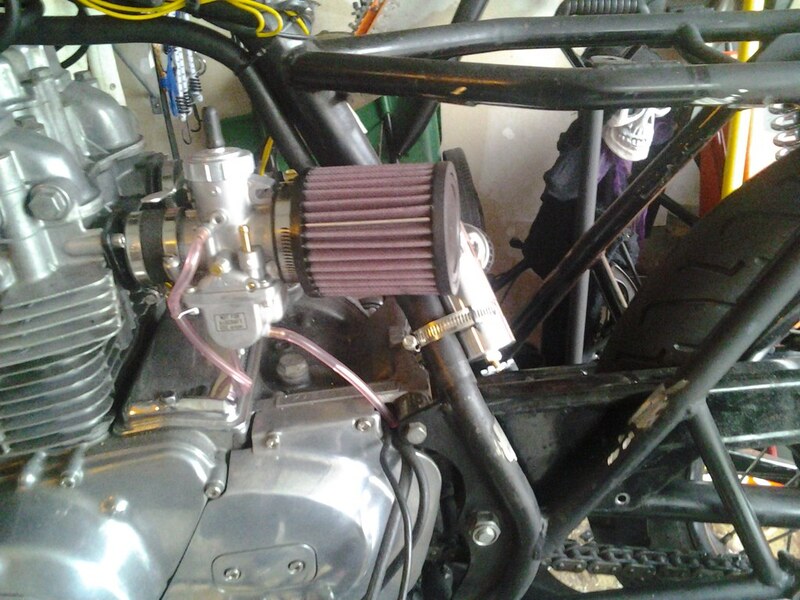 Because of the single downtube in the frame behind the motor I needed filters that had a 15-20 degree offset to angle them a bit outward, these big ol' K&N filters fit the bill. It was time for surgery. All this stuff had to be moved or removed. The new stuff on and mocked up. 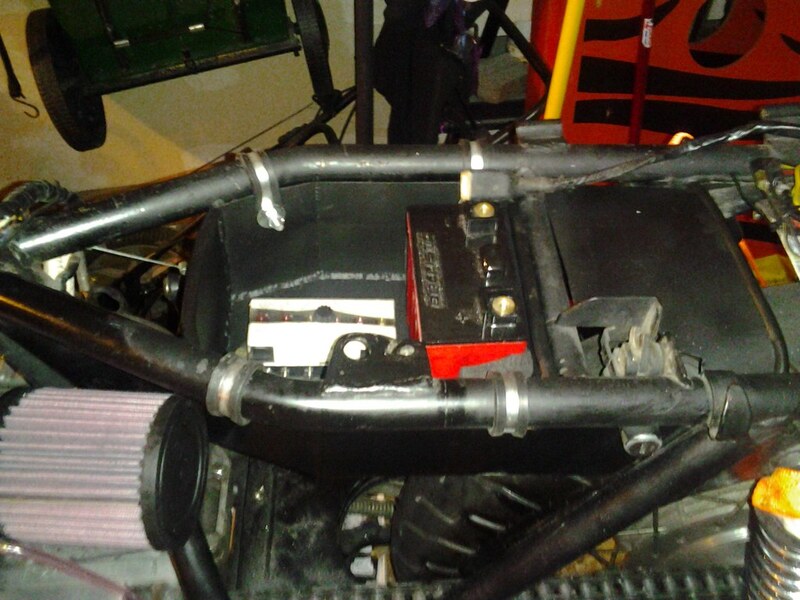 Since I'm basically using the stock seat pan and not some kind of cafe seat with room under the hump for the battery I figured that the best solution would be some type of tray or box/compartment under the seat. That was my next task. Since I don't weld (yet!) I was either going to need someone to build me an under seat tray or I would have to find other means to make it. I made my first mockup out of cardboard. Then one day while at the supermarket I saw a very large cutting board made of some type of plastic. Maybe I could make a tray from that? After some research I soon learned that there wasn't really a good glue for whatever type of plastic it was (I cannot remember of the top of my head) but I was still determined. I could use some small screws and just reinforce the corners with epoxy. After some bondo and paint it was looking almost okay. It fit the spot it needed to fit and I could get everything that I I needed into it. But it looked pretty bad and not something that I was okay with being on my bike. I'm no perfectionist but it was really bad. And the joints cracked apart the first time I put any stress on it trying to get it into place. My next two choices were to either buy some sheet metal and build a brake and rivet it together or pay someone to weld me up a tray. 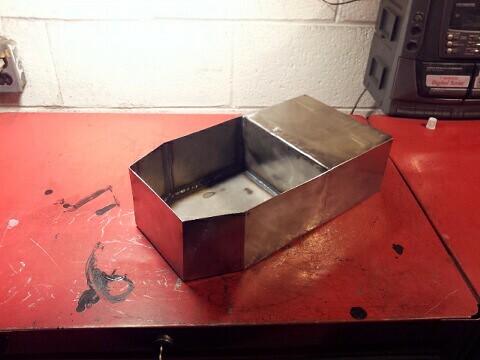 One of the members of DTT offered to do some light fabrication and welding and I took him up on the offer. 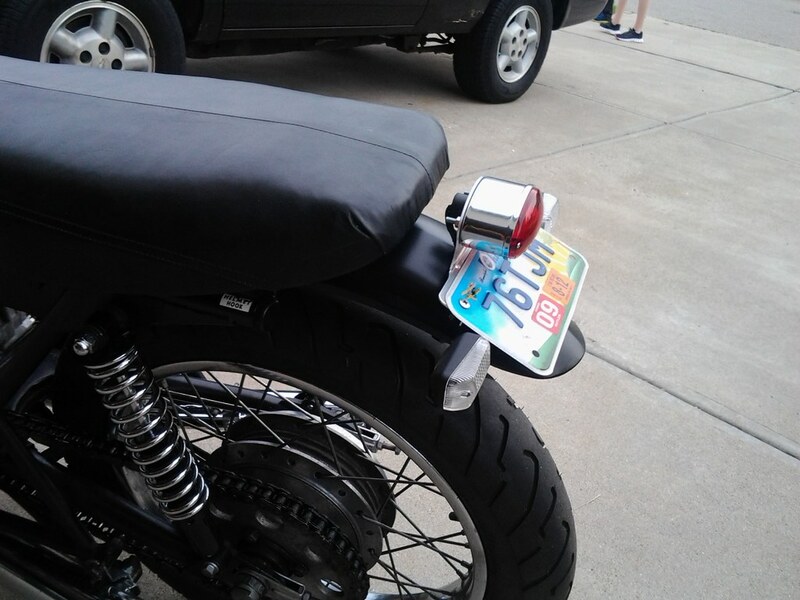 I wanted a try to go under the seat but with a rear "shelf" that was hollow underneath as a place to mount the reg/rect and also act as a short fender to keep moisture away from the contents. I put together a model of what I wanted in Google SketchUp and sent it to him. A week or so later he sent me these pictures. Perfect. I had to trim it a little here and there to get it to fit perfectly but it was exactly what I wanted. Everything fit. In fact, there was more room than I thought there would be. I was able to stand the battery up. If I were to lay it on its side I could probably remove another 2-3 inches from the height of the tray but it's fine for now. 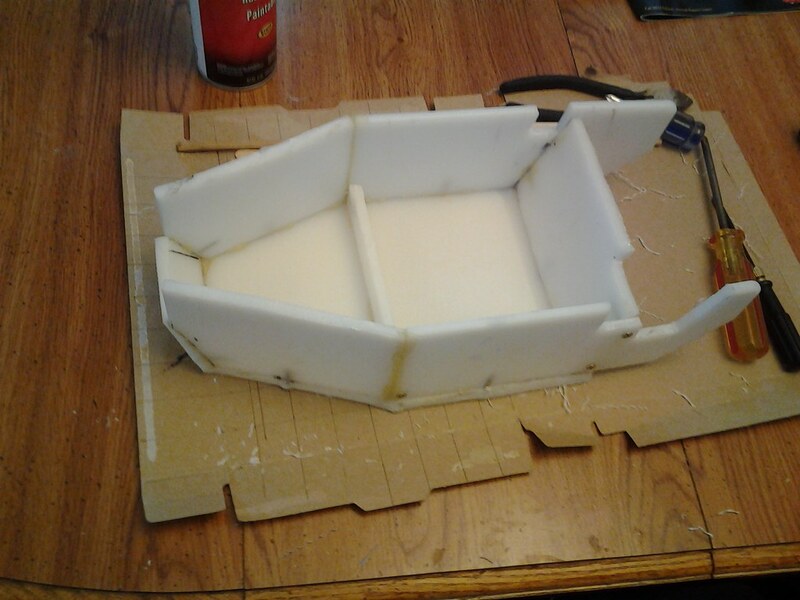 I used some of the foam from the battery packaging to keep everything in place. Most of the wiring was tidy-ed up later. With all that done it was now time to get the carbs dialed in and make sure all my electronics re-arranging did no harm. 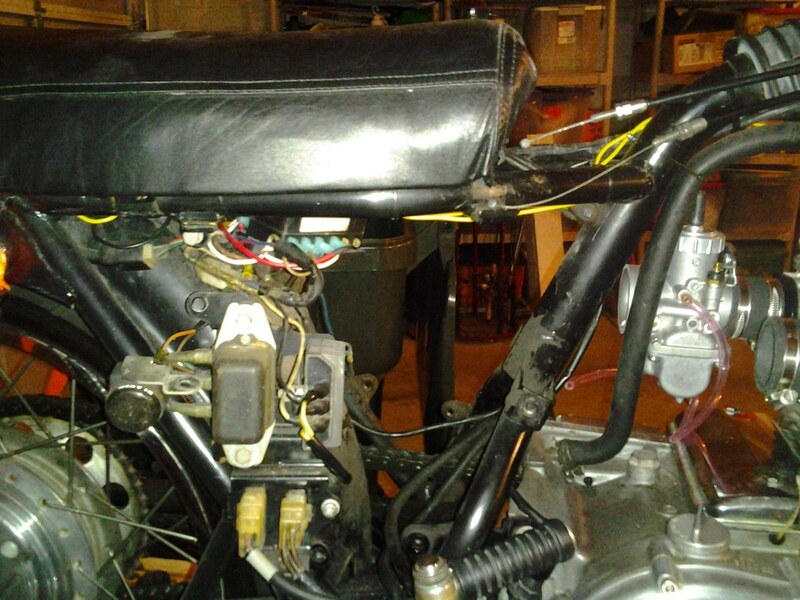 Over the Spring of 2013 I got everything buttoned up, tested all the electrics and started getting the carbs dialed in. 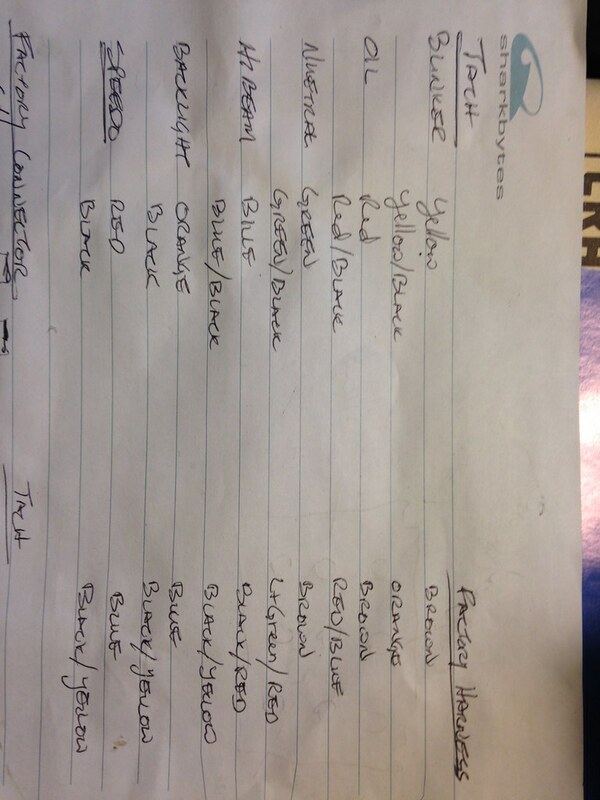 IIRC I started with 240 mains, 25 pilots, the 3.0 slide and everything else stock as they were shipped. I started there because another member of the Kawasaki Twins forum was running that setup and I figured it would get me close. However my carbs/bike hated the 3.0 slides, they just would not run. I went back to the 2.5 slides and it started right up. I've tried changing the pilot and it seems to like the 25 best. 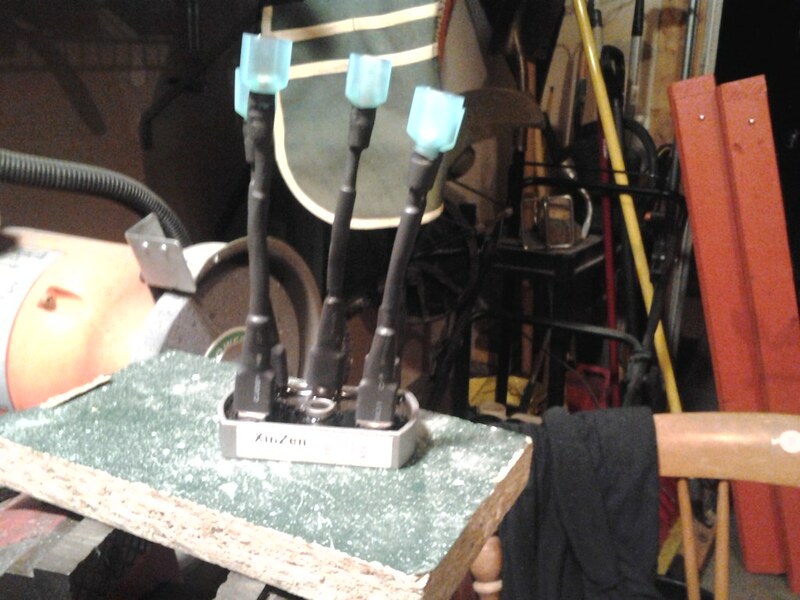 It is way too rich and fouls plugs if I use a 30 and 20 is way too lean and difficult to start. I've been between 200-240 on the mains and am currently using the 220s. I had a little stumble for the longest time about 1/4 throttle. I went up a clip on the needle earlier this year and that really smoothed things out. While I was getting everything put back together I touched up paint on the frame for the brackets I had cut off and I addressed some other cosmetic issues. 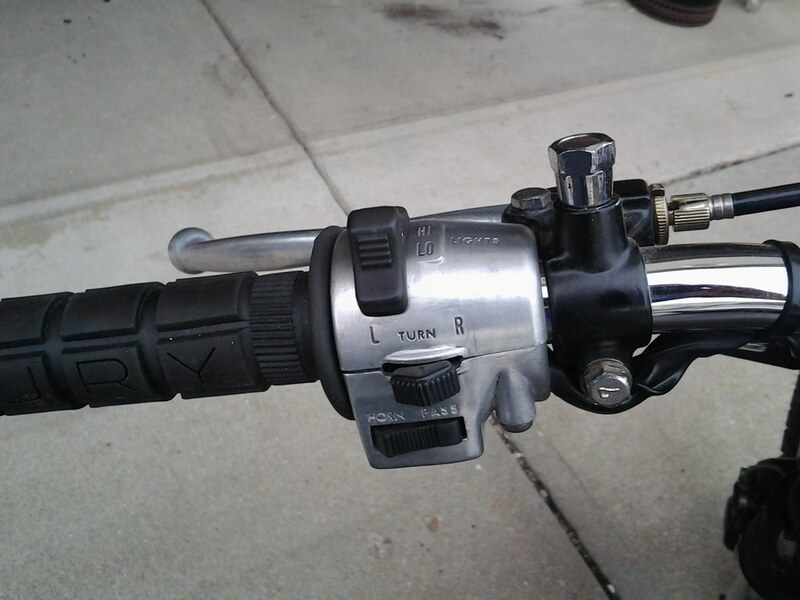 I stripped the paint from the handlebar controls. I painted the rear fender satin black to match the under seat tray and everything else. 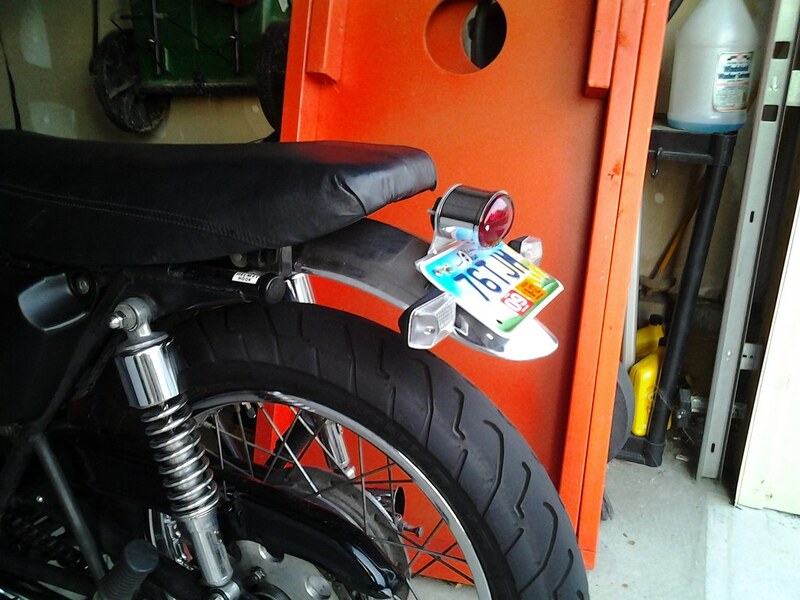 I put together a little tail light, turn signal, and license plate assembly for the rear fender that wasn't too ugly. 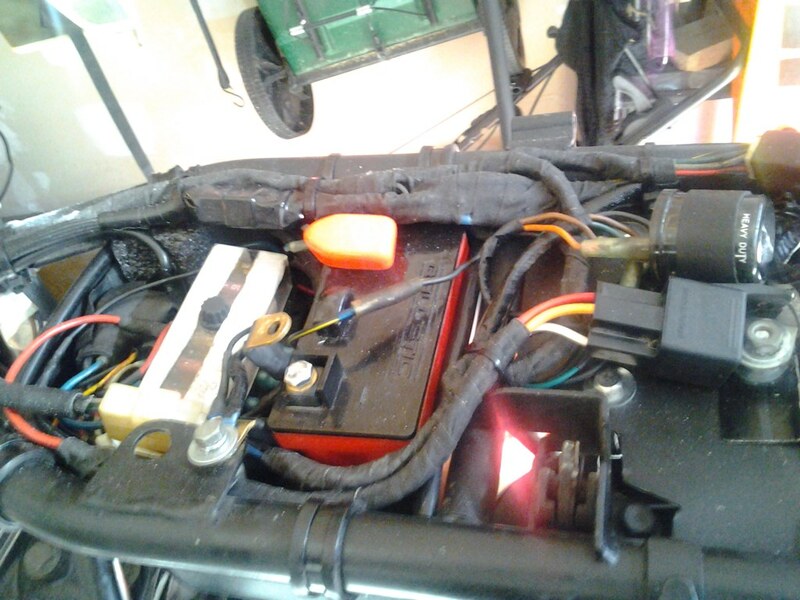 The battery / electronics tray was in and looked pretty good. The triangle was cleared. As a whole the bike was looking pretty good. 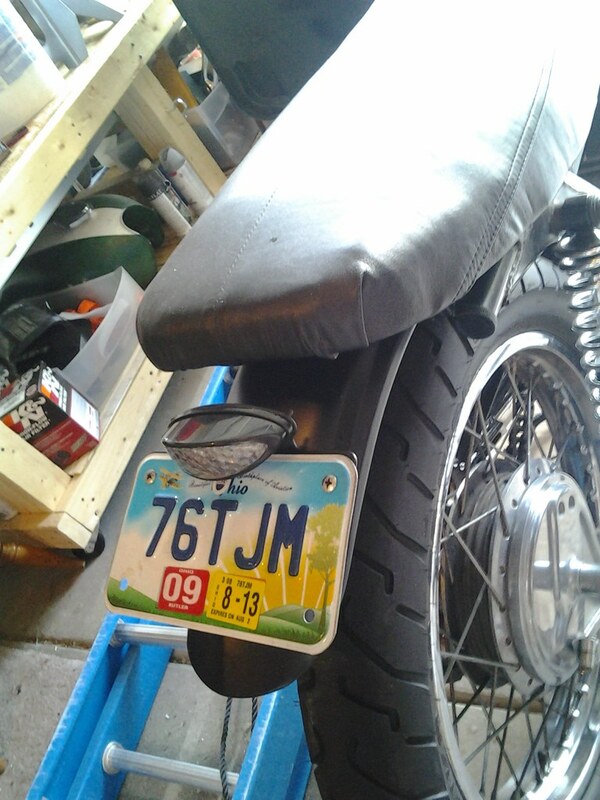 I bought a new integrated tail light / brake light / turn signal / license plate unit to further clean up the rear fender. 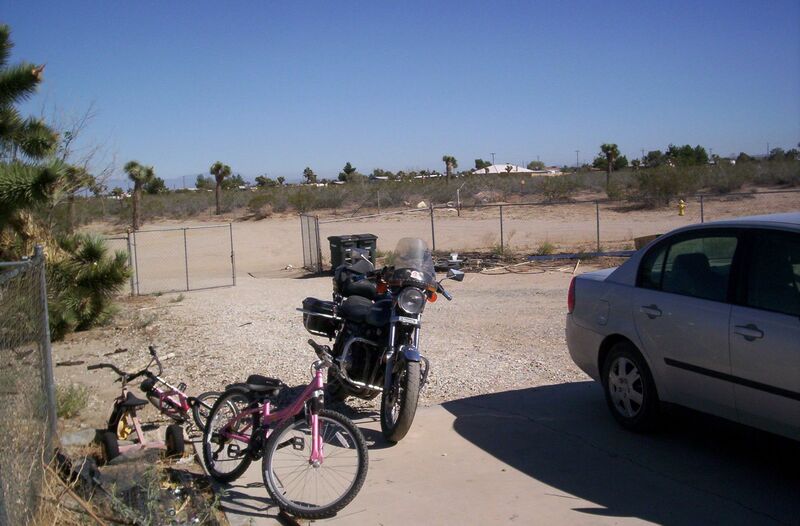 It was now the end of June 2013 but I had not had much time to ride because we were working on selling our house and buying a place a little further out with a nice piece of land and a great big out-building/barn/shop. Around the first of August we moved into the new place and so did my bike. 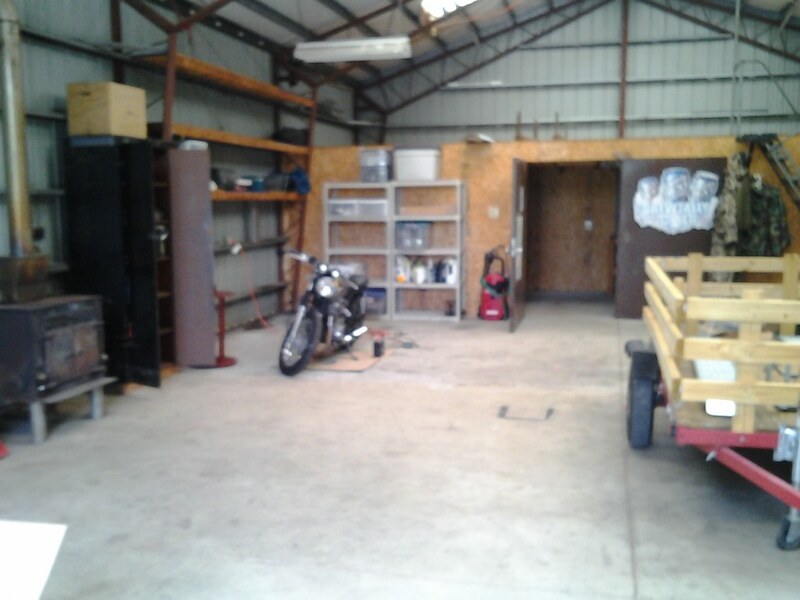 Though I now had a great big shop for working on the bike it took me a while to get used to all the work that needed to be done around the new home. Additionally we had to buy a lot of new stuff (big lawn mower, chainsaws, etc) that left little budget to spend on motorcycles. Fall came and went. Winter came and went. Spring came and went. 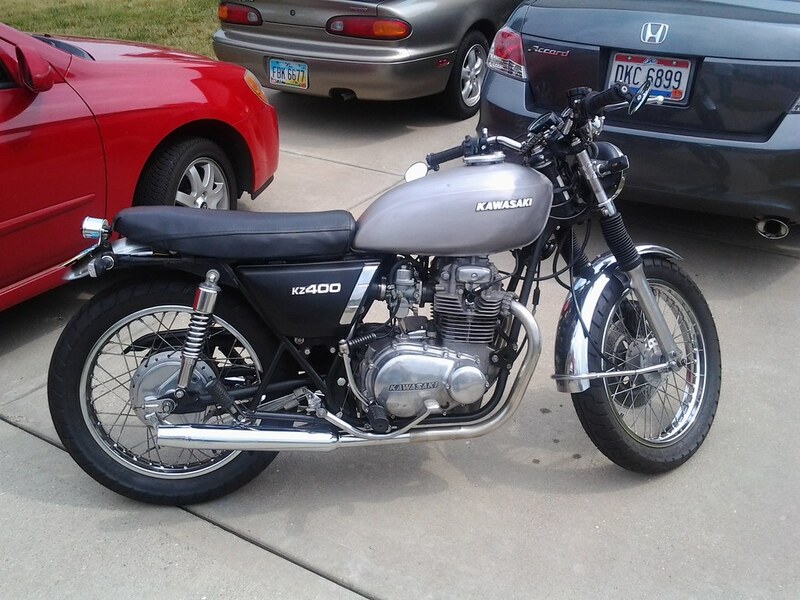 Around June of 2014 I saw something on Craigslist that I could not pass up - a 1978 KZ400 B with about 17K miles for next to nothing. 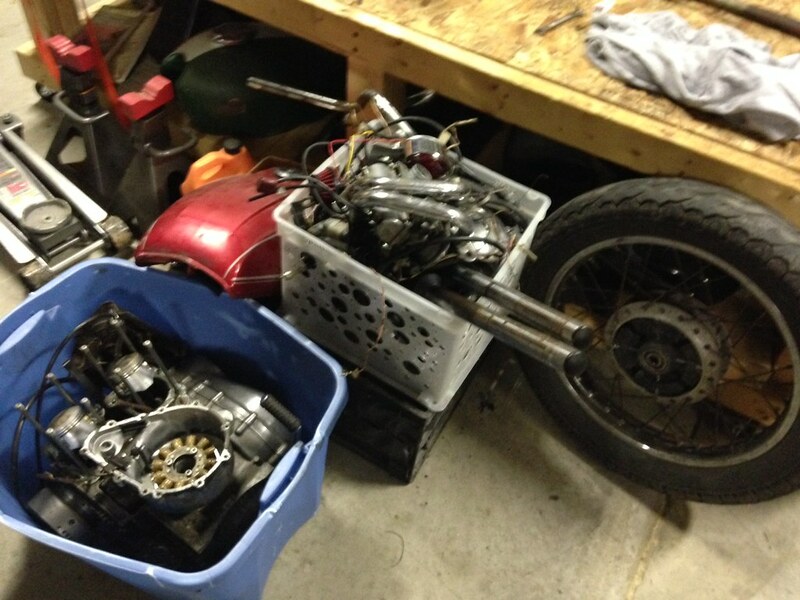 The PO, a 17 year old kid, bought it to build a cafe racer and it ran fine. 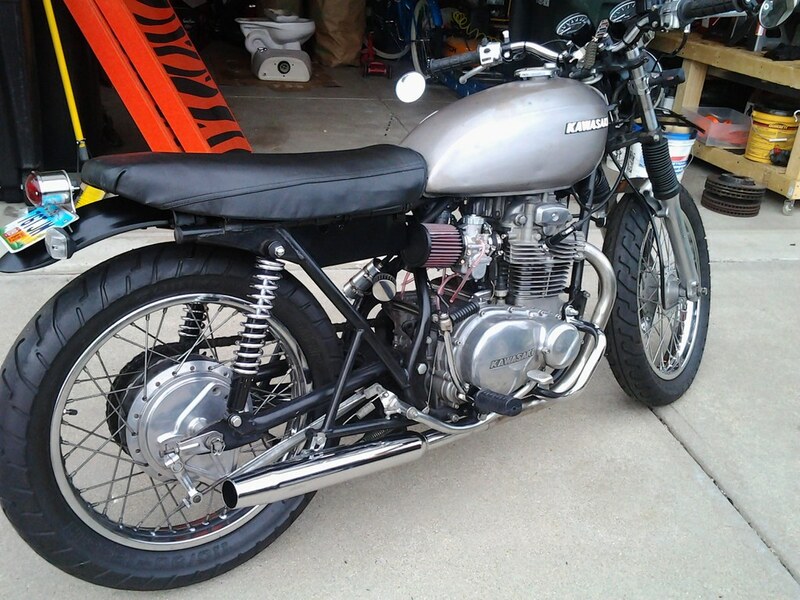 The tore town the top end to fix oil leaks, lost his motivation, and bought another bike. I brought it home and proceeded to finish stripping it down. 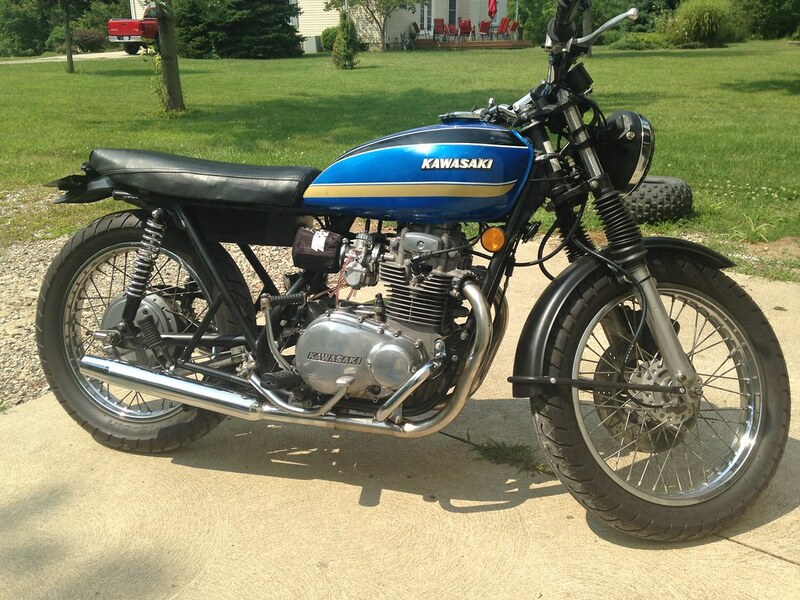 This one would become the scrambler that Kawasaki should have but never built - like the CL350/450 but a KZ400. 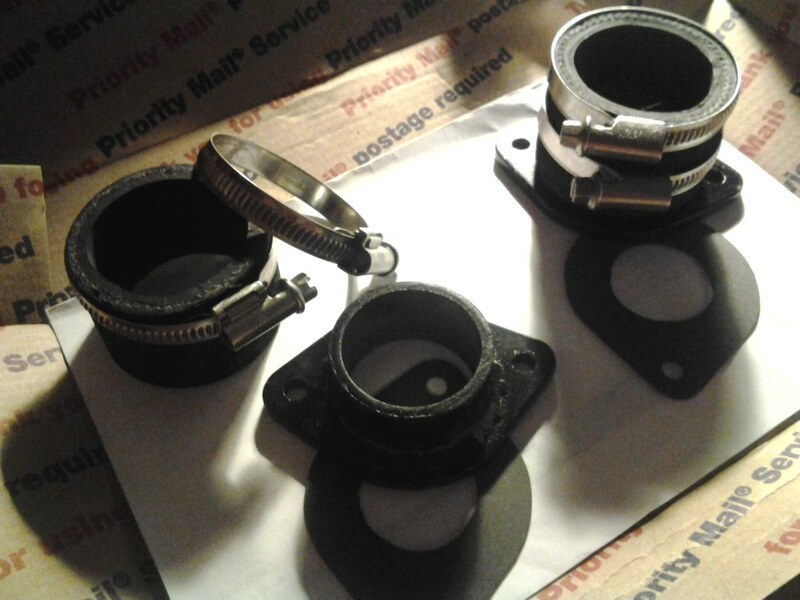 Ordering parts, painting the frame, replacing seals and bearings kept be busy. 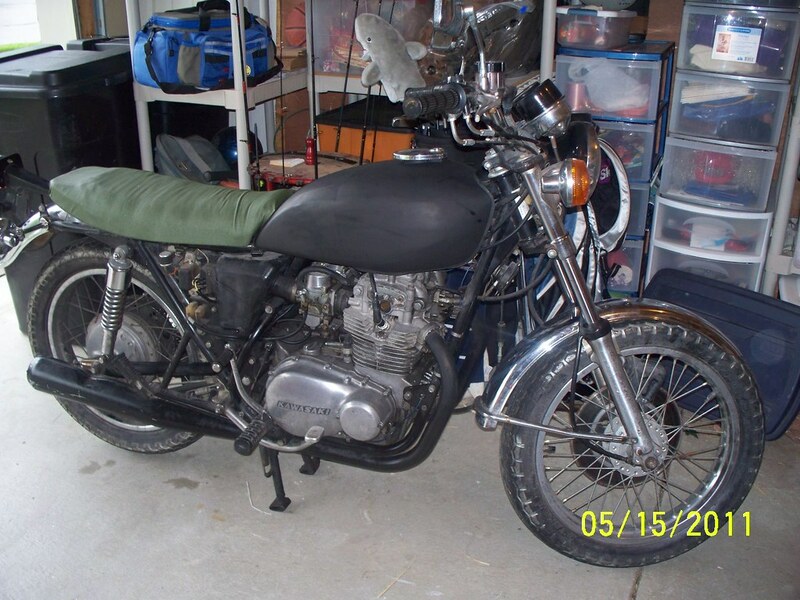 Around the same time my Dad rolled a 1972 Triumph Bonneville into the shop to start restoring it. Winter came again and the 76 KZ400 waited for spring. 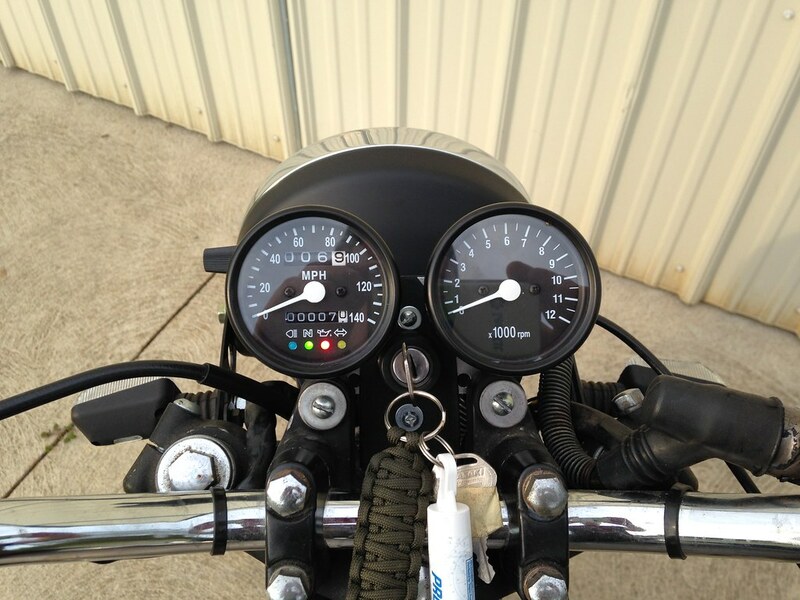 Spring 2015 is finally here and before it's warm enough to start on what seems to be an endless list of clean up things that need done around the yard I decide to update the tach and speedo to a pair of 2.5" mini gauges to clean up the front end some more. 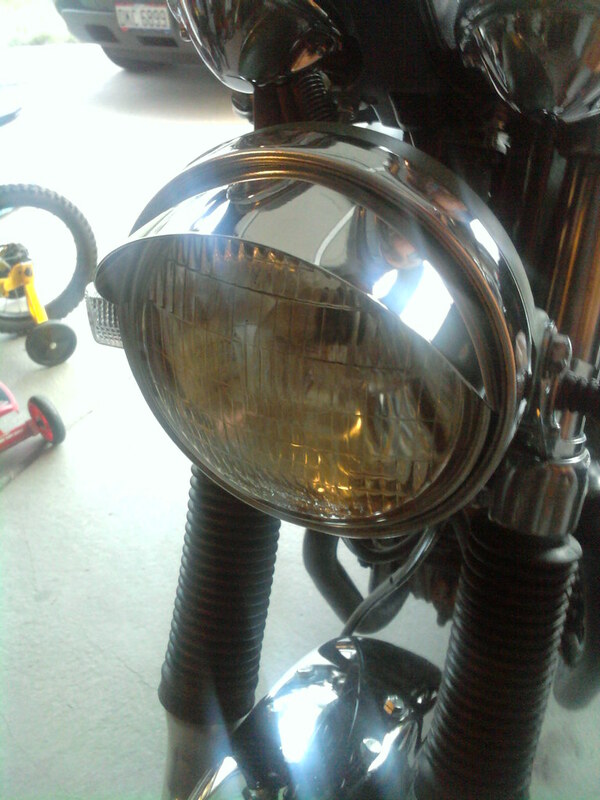 I also wanted to swap out the old sealed beam headlight for an H4 style and the simplest approach seemed to be a whole new headlight assembly, bucket and all. 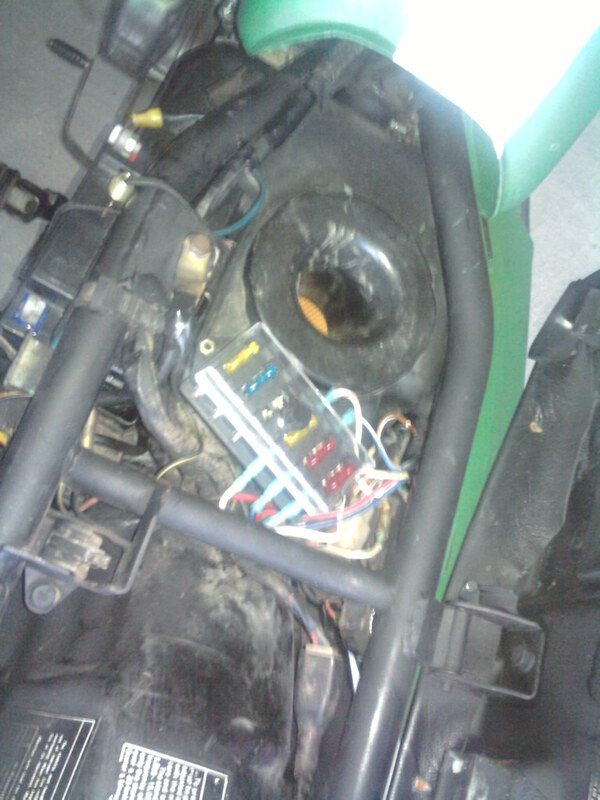 My factory wiring to new tach/speedo diagram. 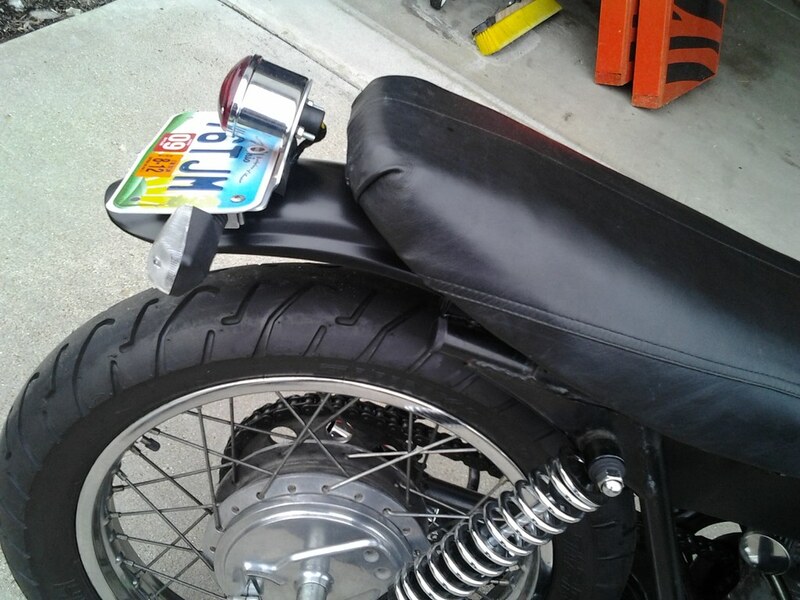 The front fender found its way back on the bike after a satin black paint job. I have actually found time for the first time in a couple years to ride the thing and have been enjoying the heck out of it. That pretty much brings us up to date. A couple weeks ago I swapped out the fork gaiters, the old ones were cracked and crumbling apart, for a pair of Rancho shock boots - look good and are cheaper. I replaced the old pair of dress socks I was using for pre-filters with a pair of K&N pre-filters more suited to the job. And I replaced the tank with a nice one that looks right. What's left to do? Not a bunch. I'd like to swap out the fork springs for a pair of Progressive springs. Eventually I'll have to tear down the top end to try to fix the minor oil leaks. At some point I'll swap the brake lines for some braided lines. And that's really about it. 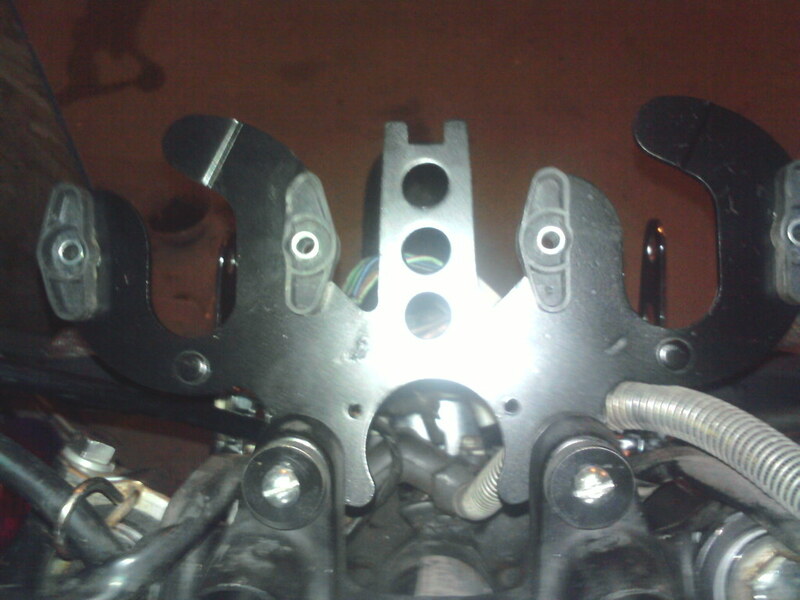 Remove the gauges and idiot lights from the bracket. If I remember correctly there are studs at the bottom of the bracket that feed through the two bosses on the top triple. Remove those and drill out the spots they were in so you can fit a bolt through each of them. Basically after that you can fit the bracket under the top triple instead of on top of it. Find some bolts, washers and something to use as spacers to hold it all together. You can see there that I used what look to be rubber washers that are about 1/4" thick. Later I added ones that were much thicker, or maybe even several of them stacked, to move the bracket down even lower. You may need to also lower your headlight depending on how low you go with the gauges. 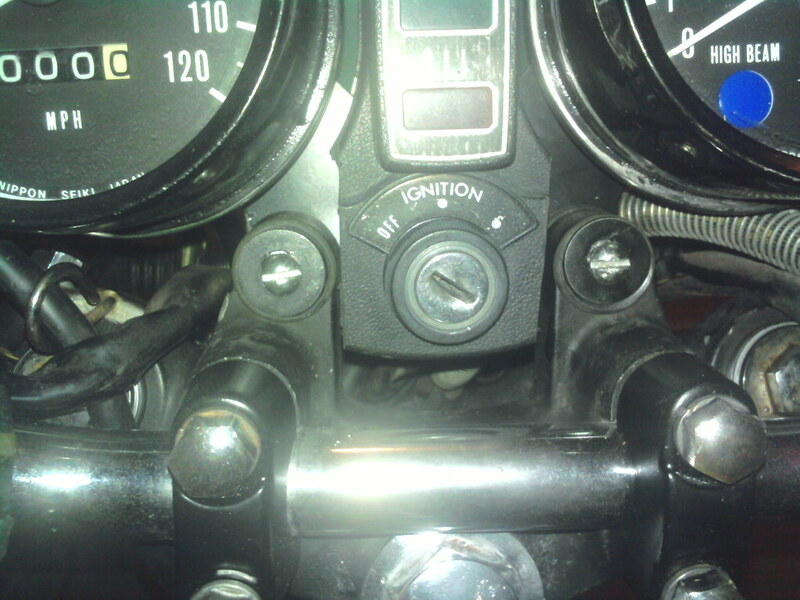 The other thing you'll have to address is the little housing that covers the idiot lights and the ignition. It is shaped like a bat wing and originally covered the studs that attached to the triple. With your gauges now lowered it will not fit. I simply cut the "wings" off so it would fit in between the two mounting points. You may want to try to salvage some of plastic you cut off and glue them back on to cover the sides that are now open. Hard to explain but you'll see what I mean in the pics. Very cool, I may look at doing that soon; the headlight's already lowered out of the way. Good luck with the scrambler!